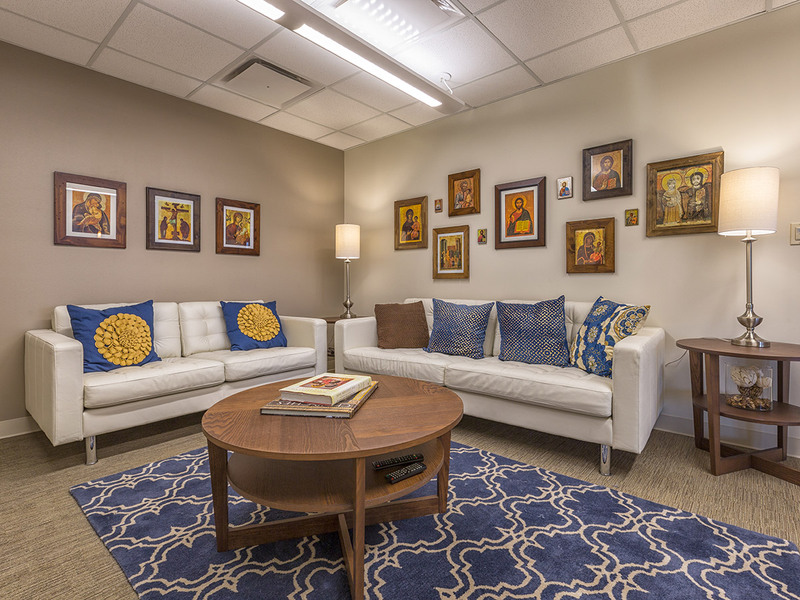 WORSHIP, WORK, & MINISTRY ~ Integration Design Group offers expertise in the design of the various spaces that support the life of the church community – from the central importance of the church building to social halls, flexible gathering spaces, offices, work areas, and residential spaces as well. 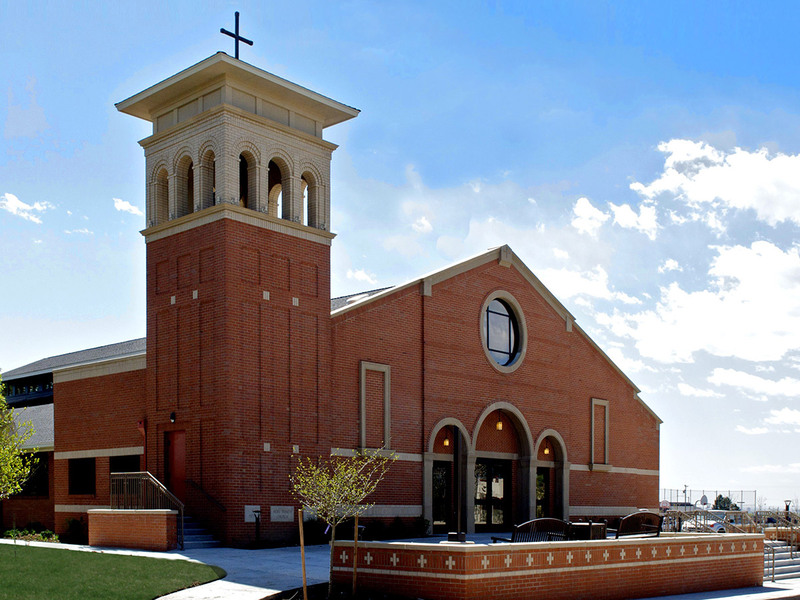 Our overarching goal is to design beautiful buildings in which the Church would grow and prosper. 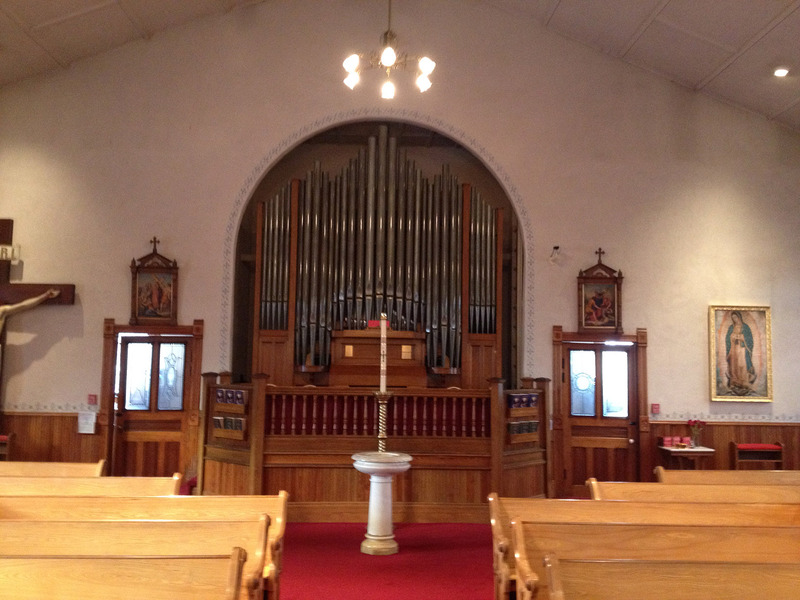 Original organ platform and entry to Nave. 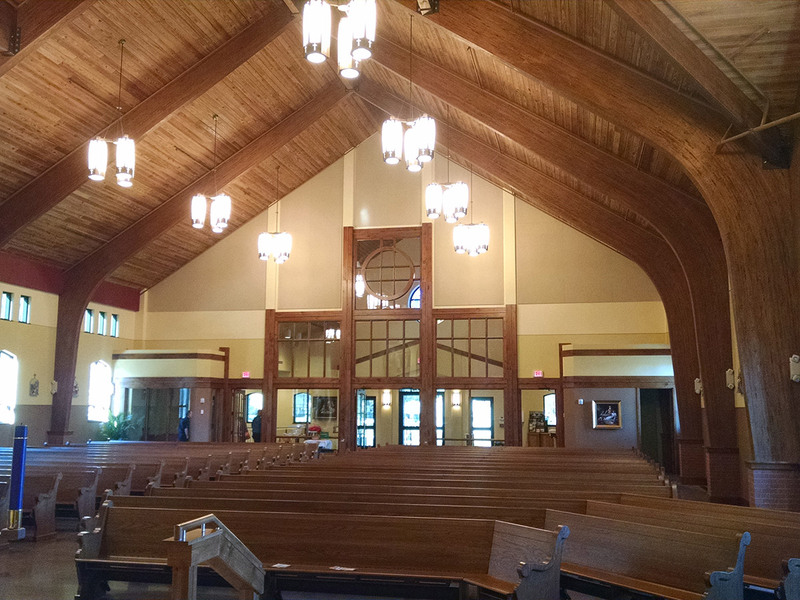 Organ and choir loft lifted to provide enlarged entryway and viewing from foyer. 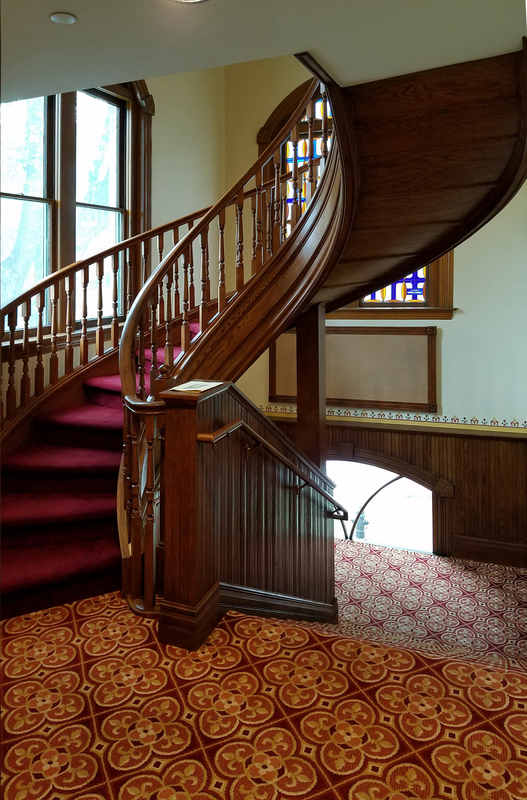 Constructed in 1892, this historic masonry and timber building in the heart of Aspen, Colorado was much in need of renewal and restoration. 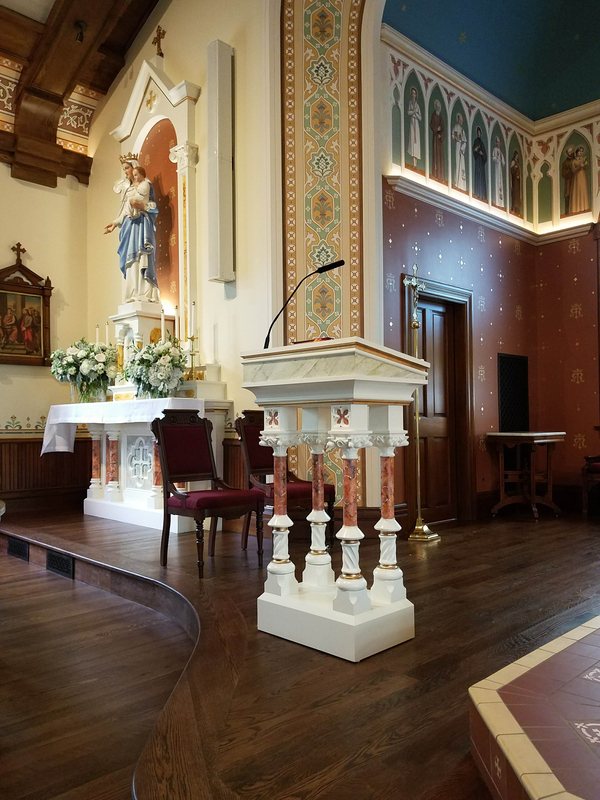 The parish family engaged Integration Design Group to envision a new interior that would inspire worshipers and respect the historic heritage and tradition in the 125-year-old structure. 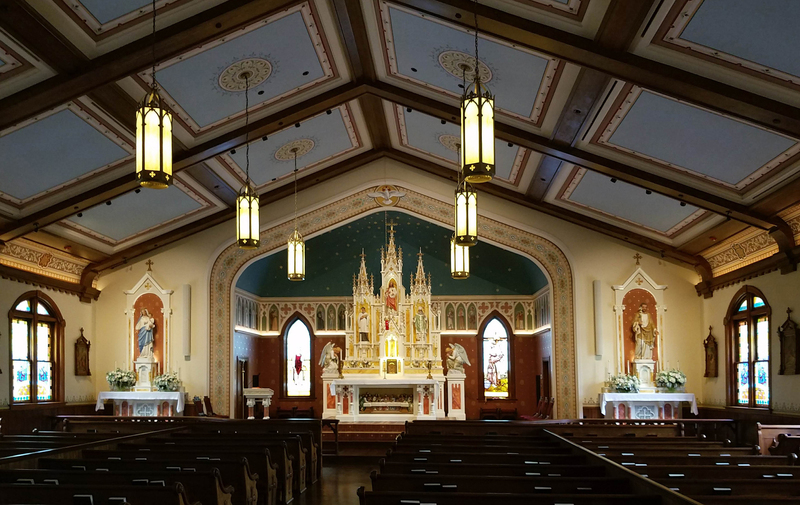 The project included complete interior renovation, restoration of historic altars and statues, new ceilings new beams and complete decorative paint scheme. 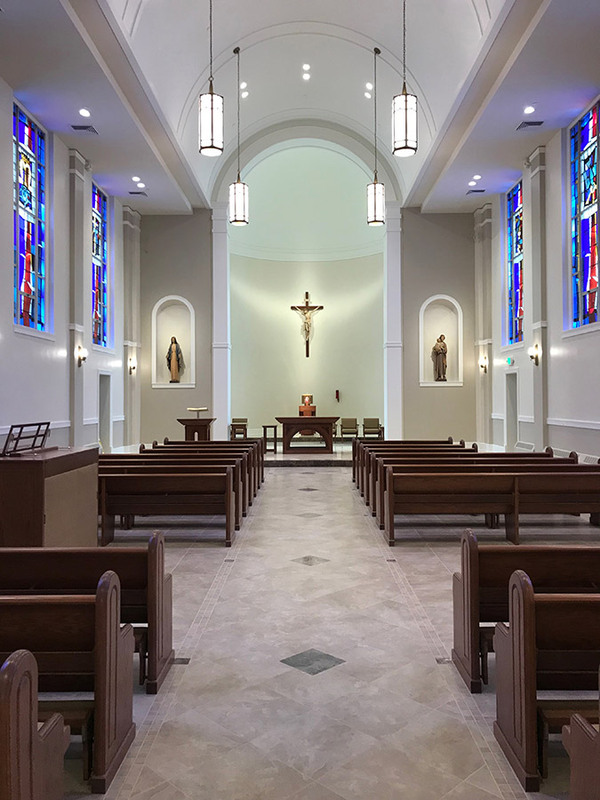 The structure was modified to create a new choir loft, fit within the existing building form – thus allowing a narthex entry space below. 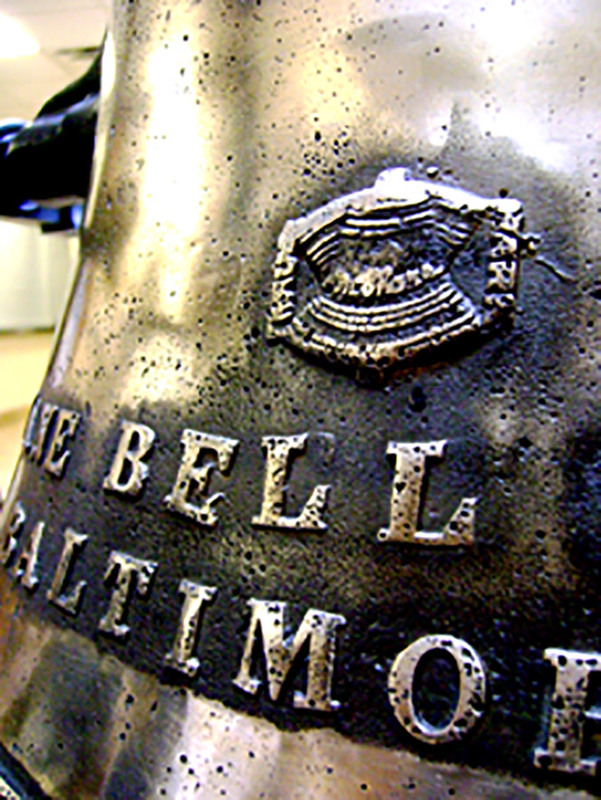 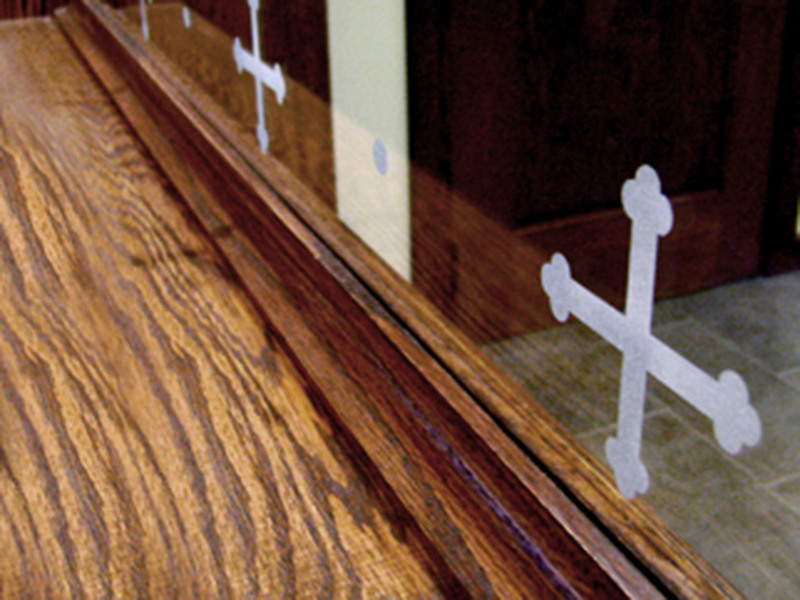 Specialty finishes were incorporated throughout the project. 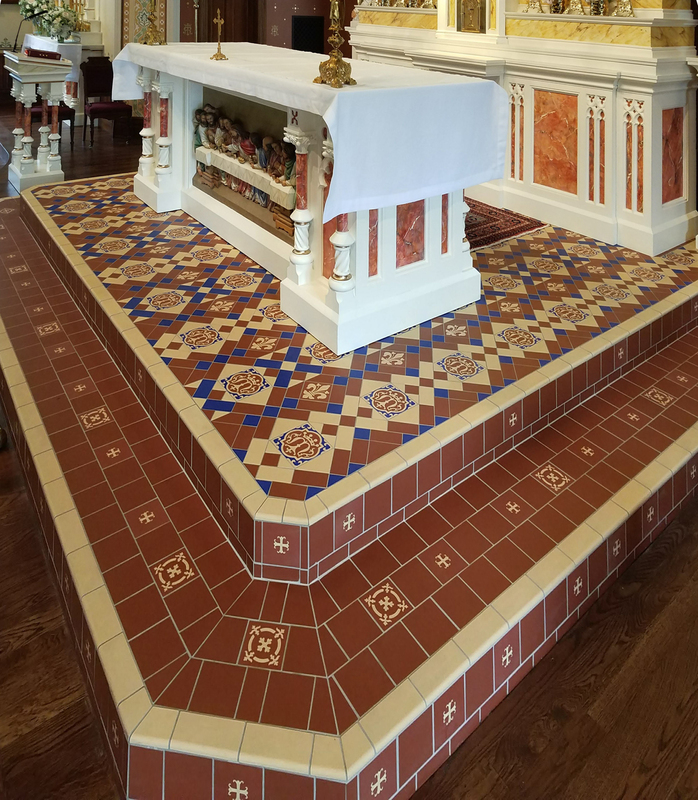 Custom encaustic clay tiles with fleur-de-lis and Marian insignia create a dramatic effect on the predella; new rift-sawn oak floors incorporate mahogany inlays; new and restored leaded glass create a threshold between narthex and nave; and custom stencil work is applied in the chancel surrounding the high altar. 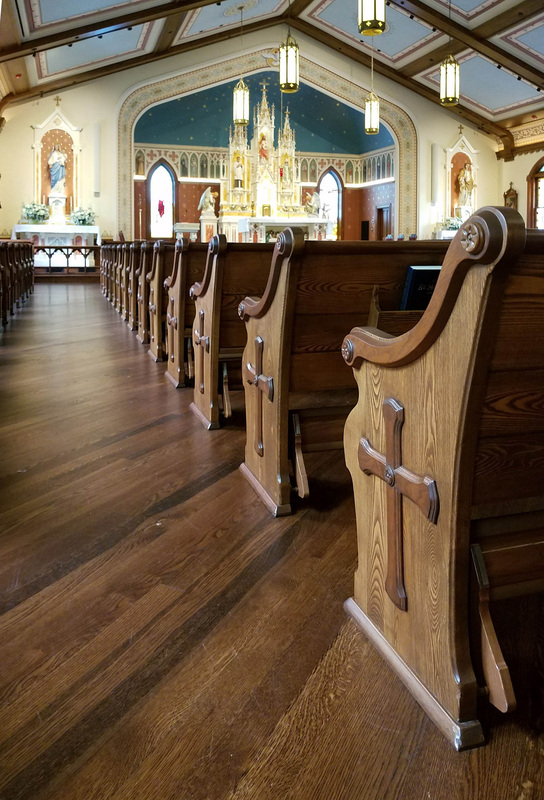 The historic pews were completely repaired and refinished. 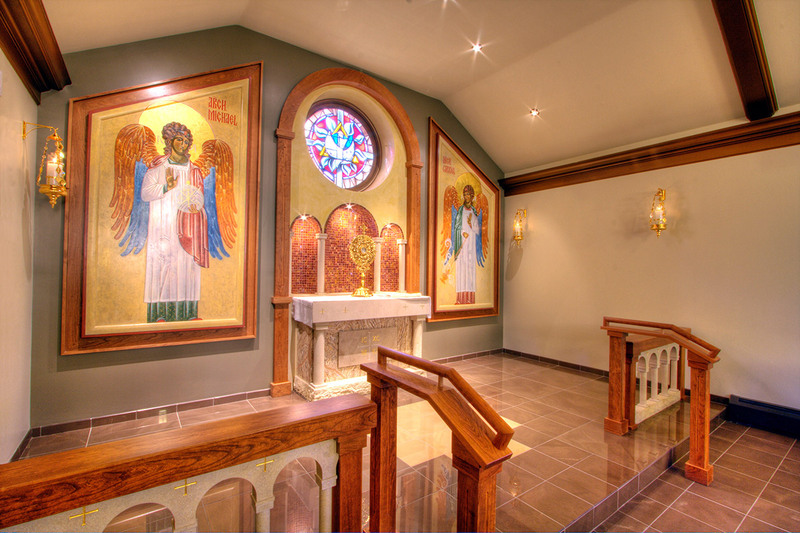 The decorative program includes a wonderful communion of saints mural, commissioned for this project, with saints selected by the parish. 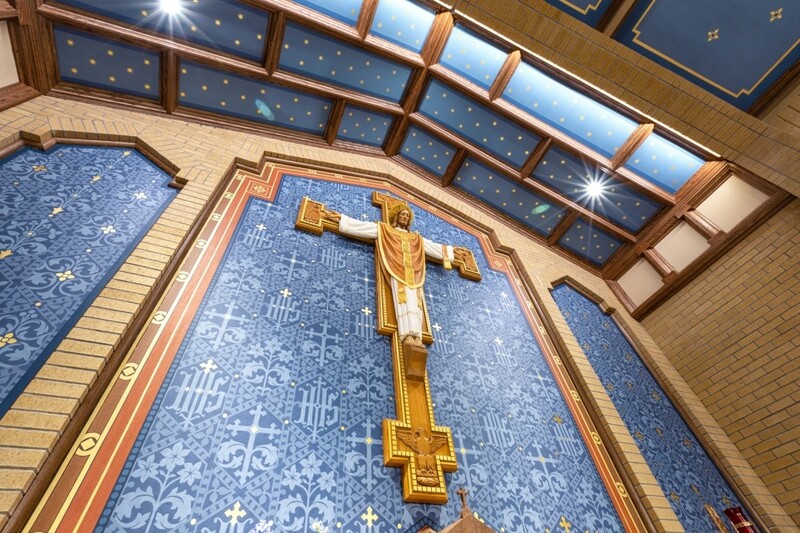 And the celestial sky above and behind the historic reredos completes the composition. 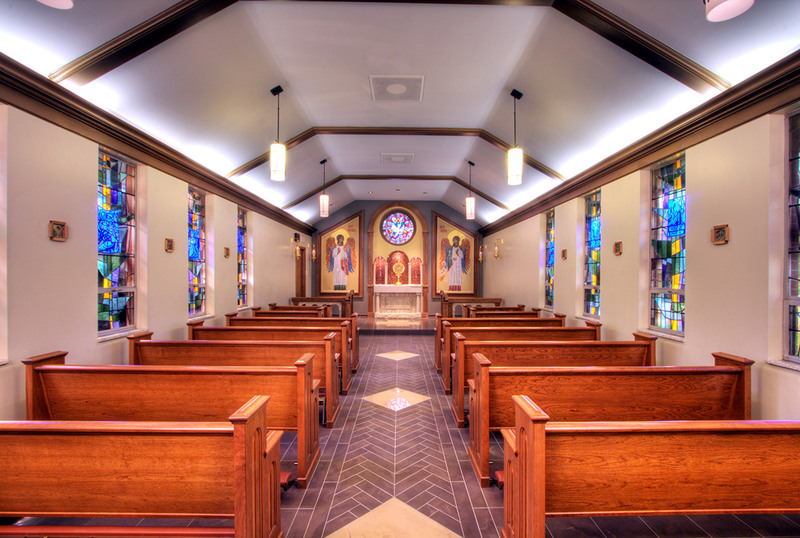 As part of their new home the client decided to set aside a large room for a new family chapel. 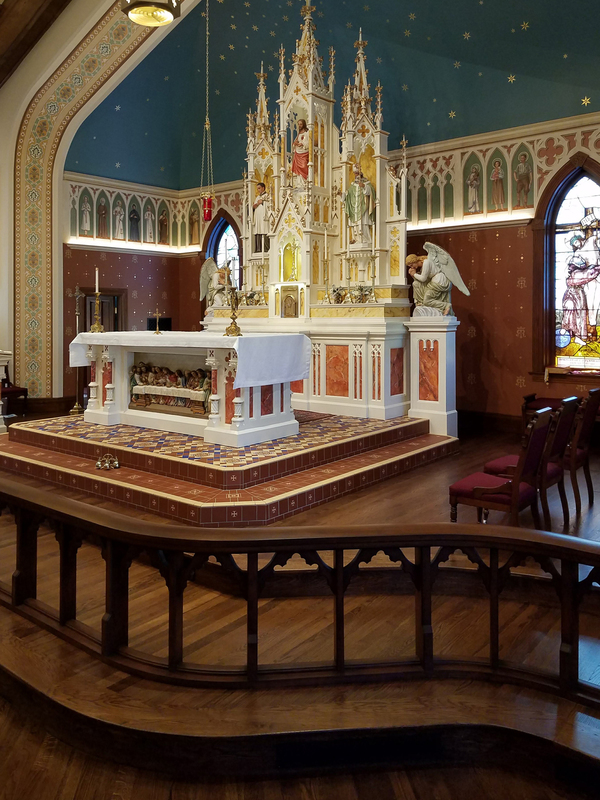 They hoped to build a very noble space for personal and communal prayer - an intimate chapel for family prayer, and yet large enough to allow several families to celebrate the Holy Mass together from time to time. 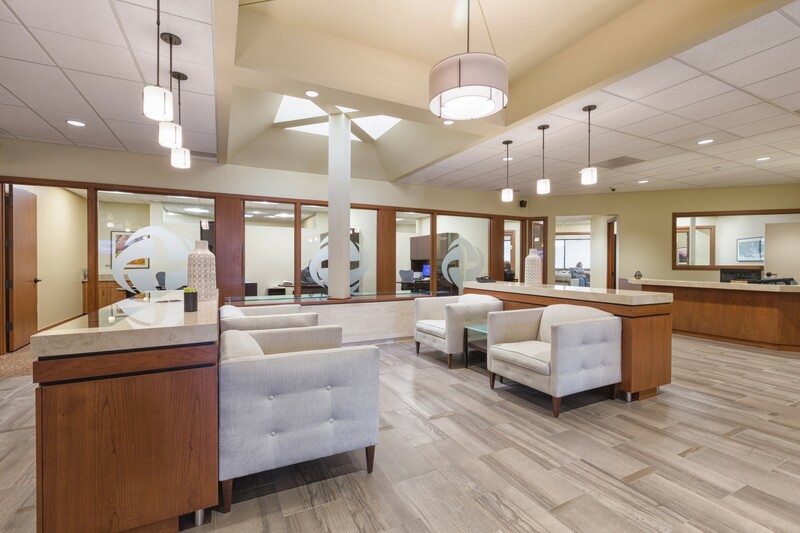 The family asked Integration Design Group to develop the vision and carry out the detailed drawings for all elements of the project. 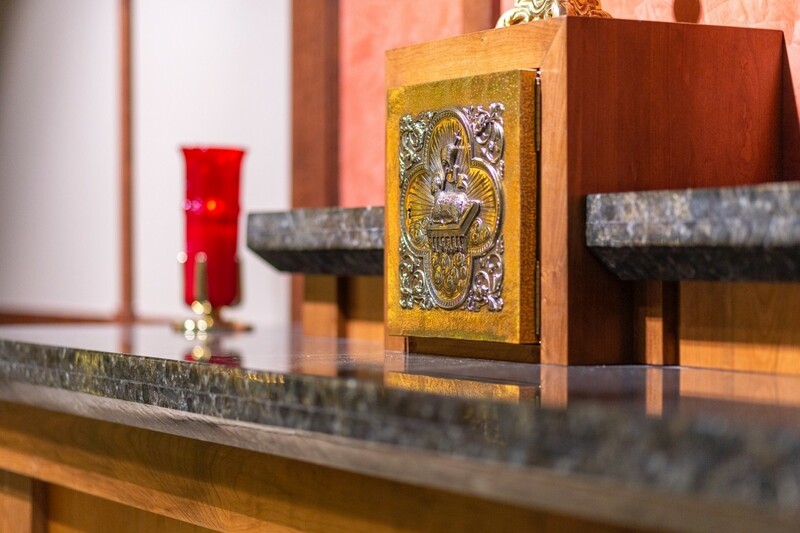 IDG worked with a team of artisans in Verona, Italy to design and produce the marble altar with carved details, the altar rail, new stained glass windows, statuary, crucifix, one-of-a-kind floor mosaics, 4' by 8' cast bronze doors, and smaller details such as the custom candle brackets. 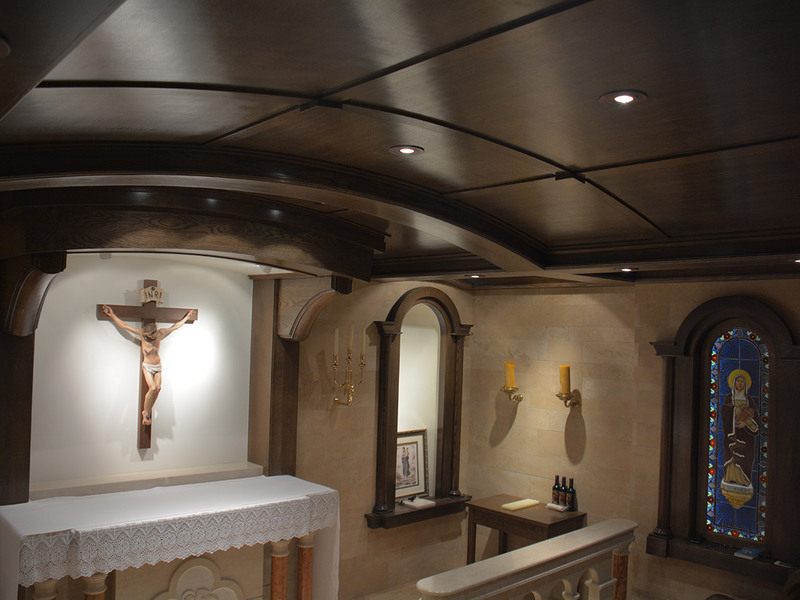 IDG was responsible for the design of the custom millwork, stone flooring, vaulted ceiling, and lighting. 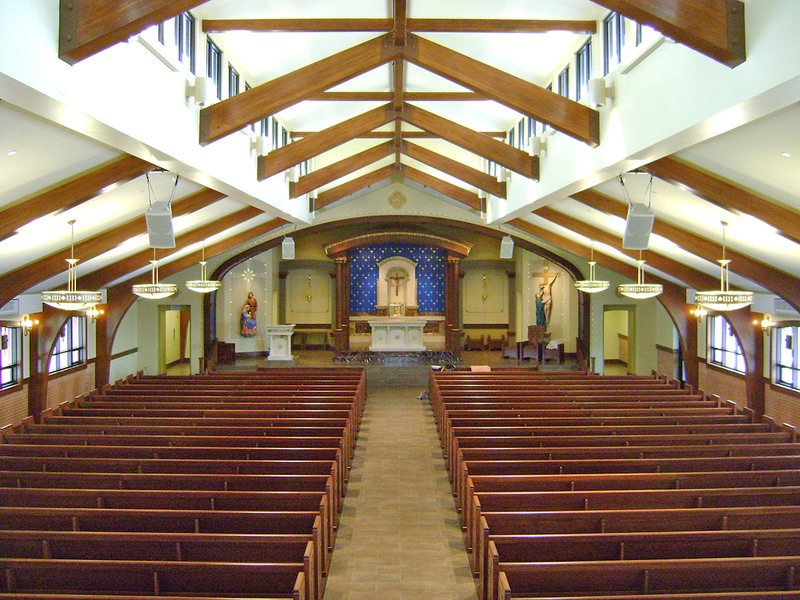 The church building at Holy Name parish was originally constructed in 1966. 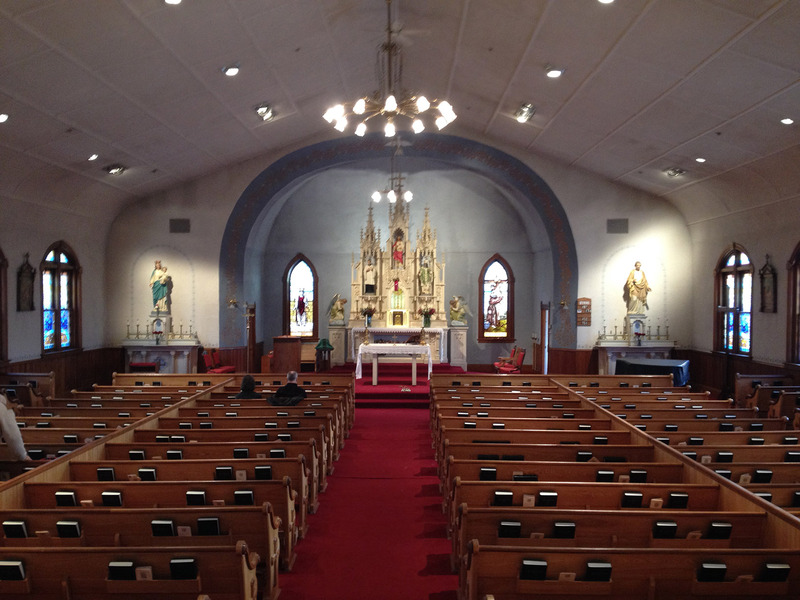 The interior was most recently updated in 1998, covering over much of the original trim details and historic elements. 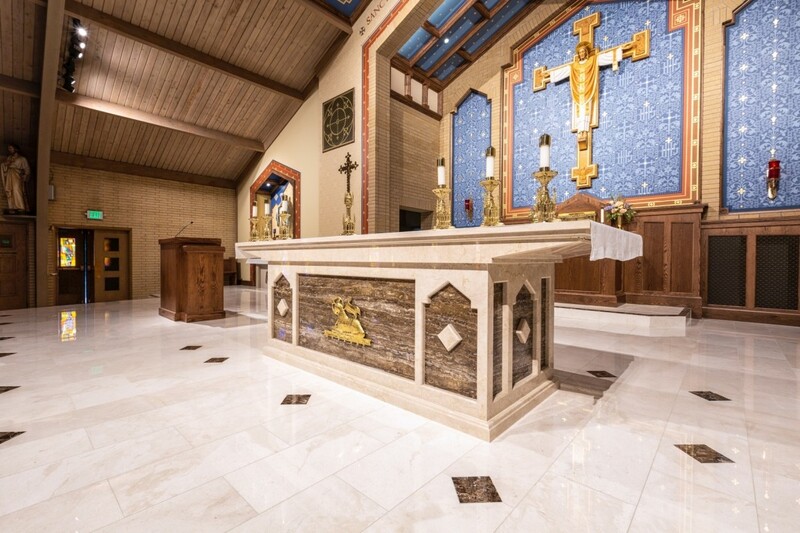 The current project includes new brick arches, new sanctuary lighting, stone tile flooring on the sanctuary platform, new stone altar, and a complete decorative paint scheme. 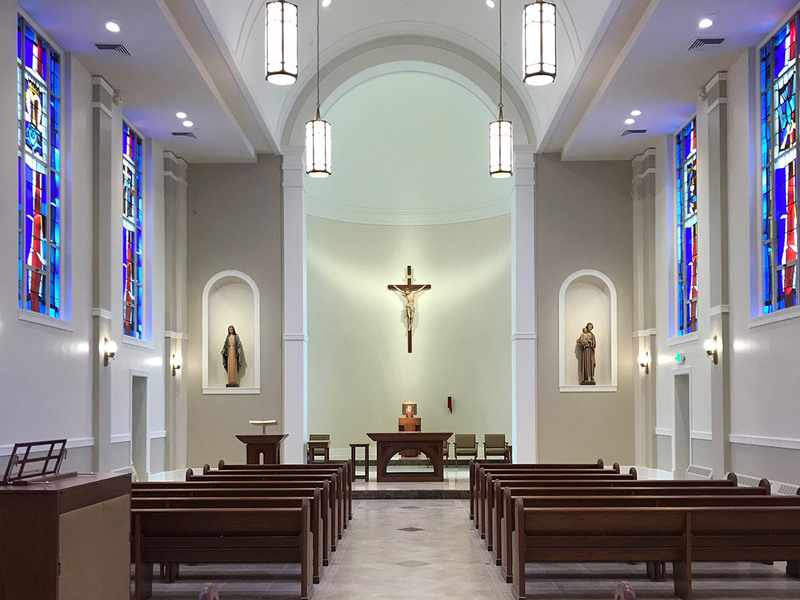 A new ceiling canopy over the main altar was built and new statuary placed in remodeled devotional areas. 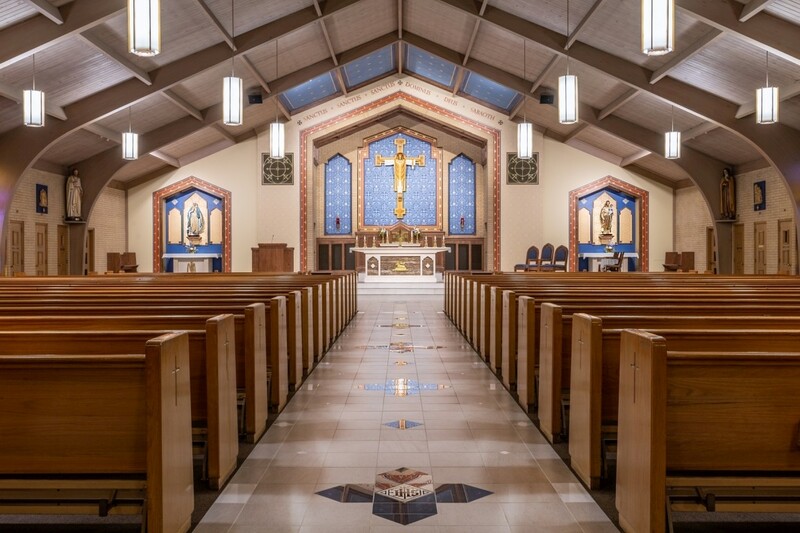 On its 50th anniversary, the parishioners at Holy Trinity Catholic Church wished to renovate and enlarge their church. 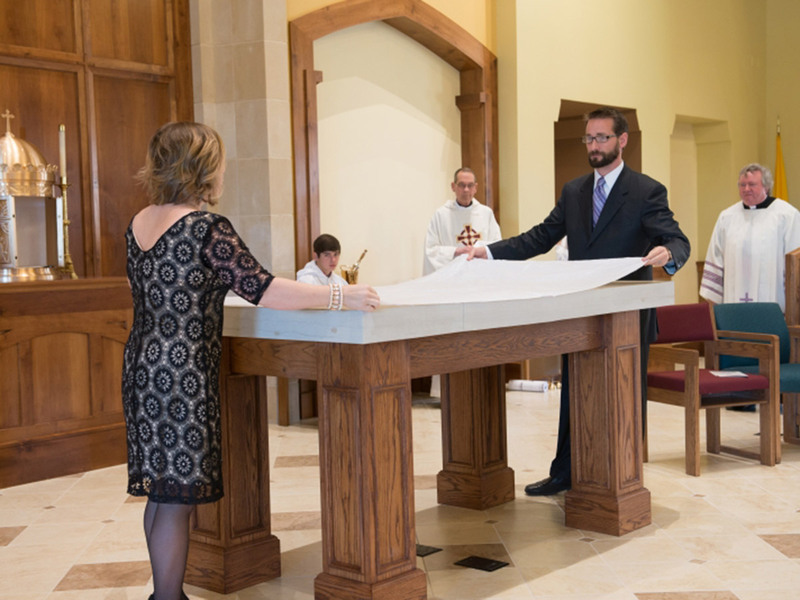 They hoped to establish a sign of faith for the next 50 years and beyond by increasing the beauty of the liturgical setting and expanding seating capacity. 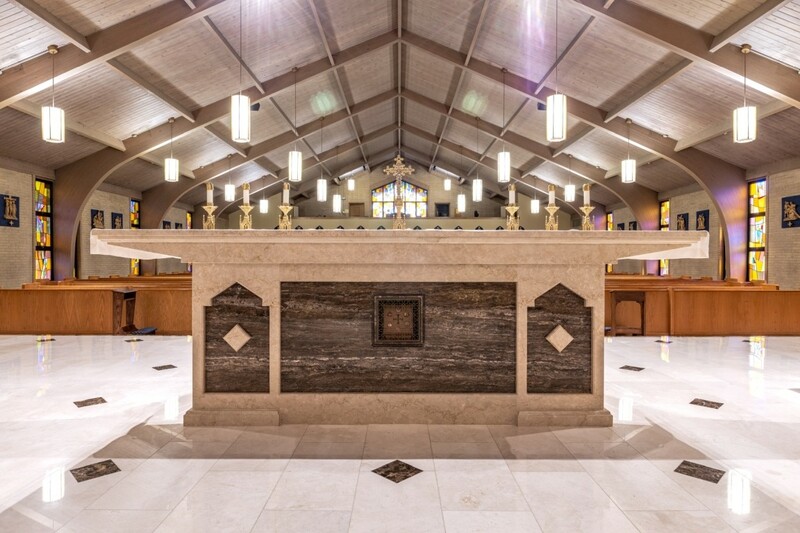 The new design creates a worthy space for communal worship and celebration of the Holy Mass. 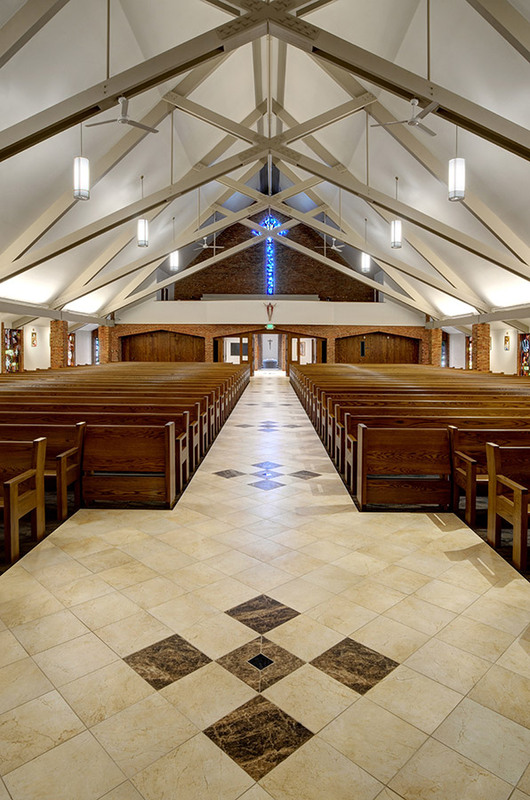 Light pours down through 5-foot clerestory windows beneath the raised center of the existing roof. 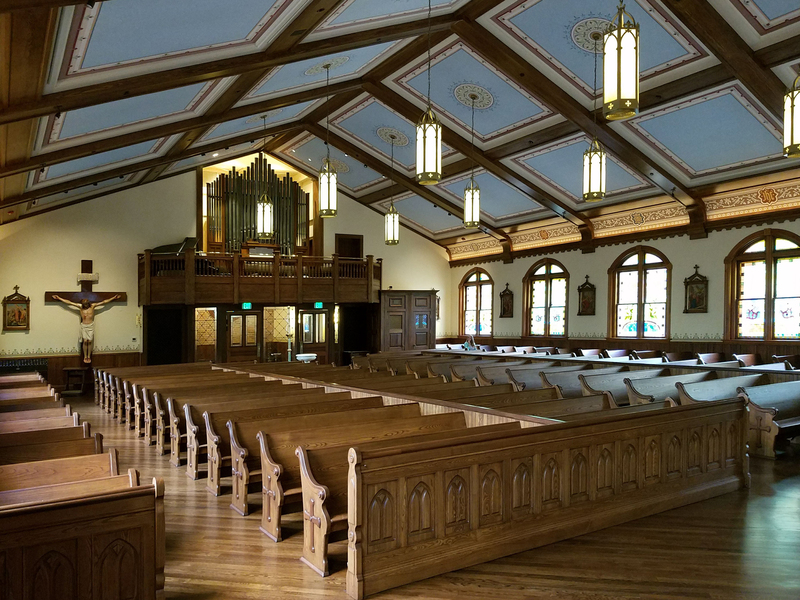 Besides enlarging the Nave, an addition to the west front of the church provides a new narthex, a choir loft, confessionals, and devotional side chapels. 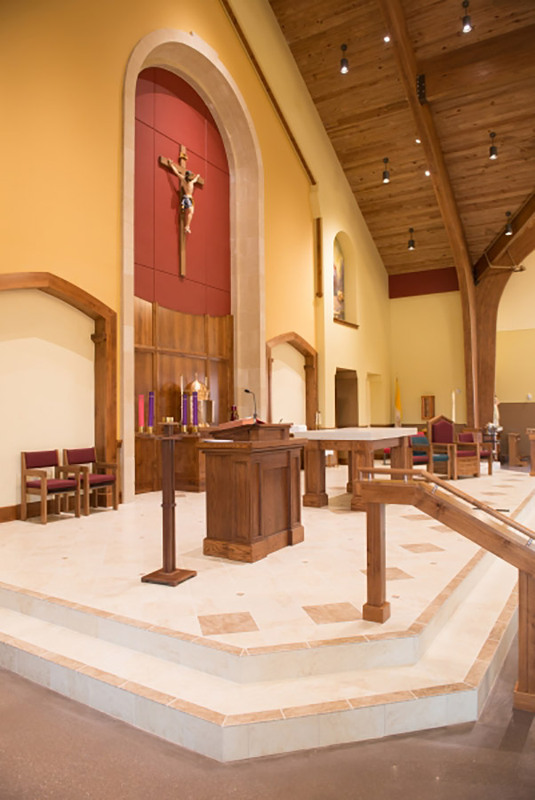 A complete interior renovation transformed the sanctuary into a rich focus for the liturgical life of the parish. 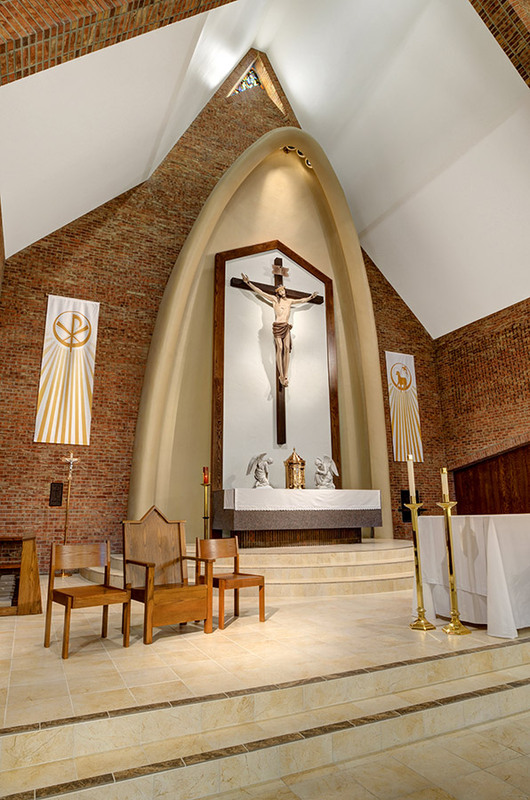 A dramatic arch sets the sanctuary apart as sacred space, surrounding the new baldachino which marks the location of the new altar and altar of repose. 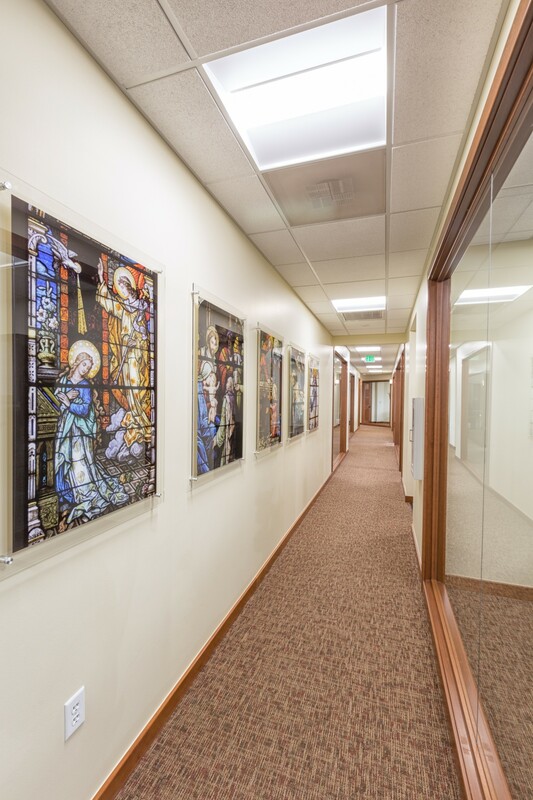 In the future, the parish will install stained glass for all windows in the nave and narthex. 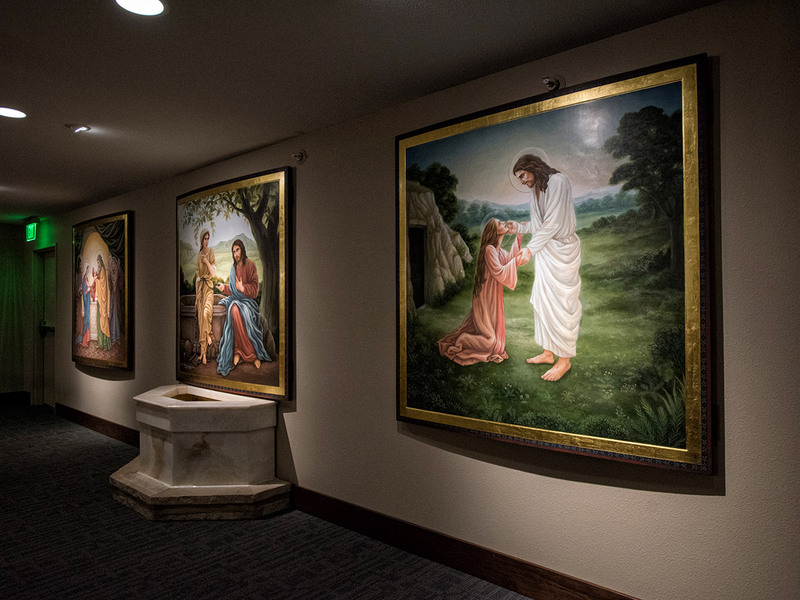 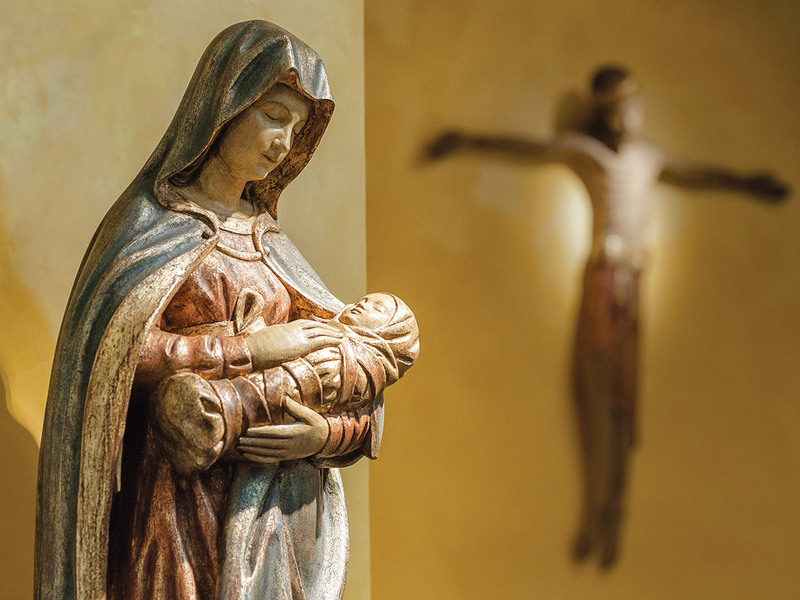 Spaces for devotional artwork have been planned for future generations to fill. 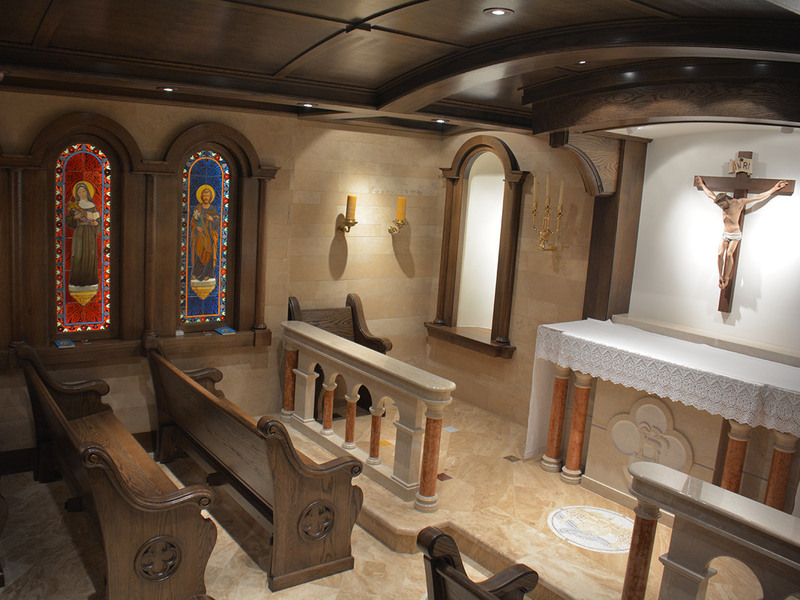 This wonderful project involved the renovation of a small chapel which had served the former convent. 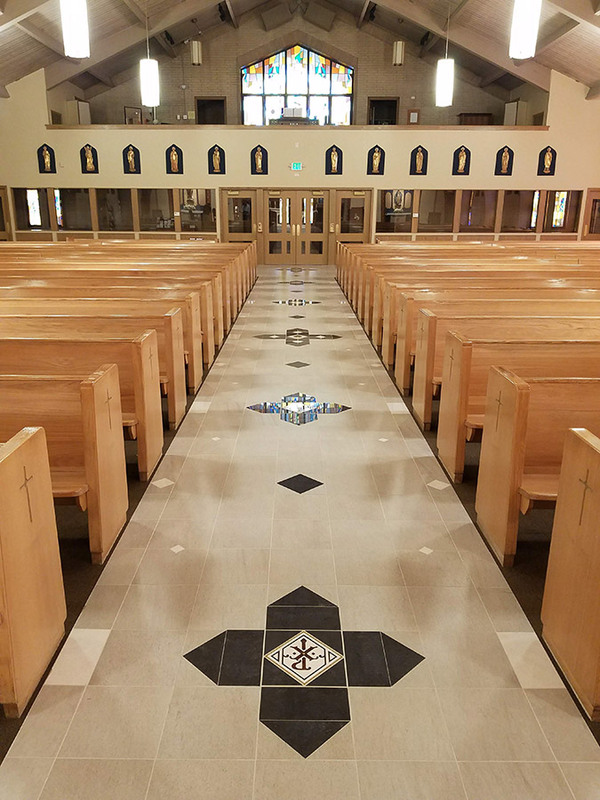 The parish family of Holy Trinity Catholic parish in Westminster, Colorado set aside the space for Adoration, but it was very plain, not well suited to private prayer, and lacked basic amenities. 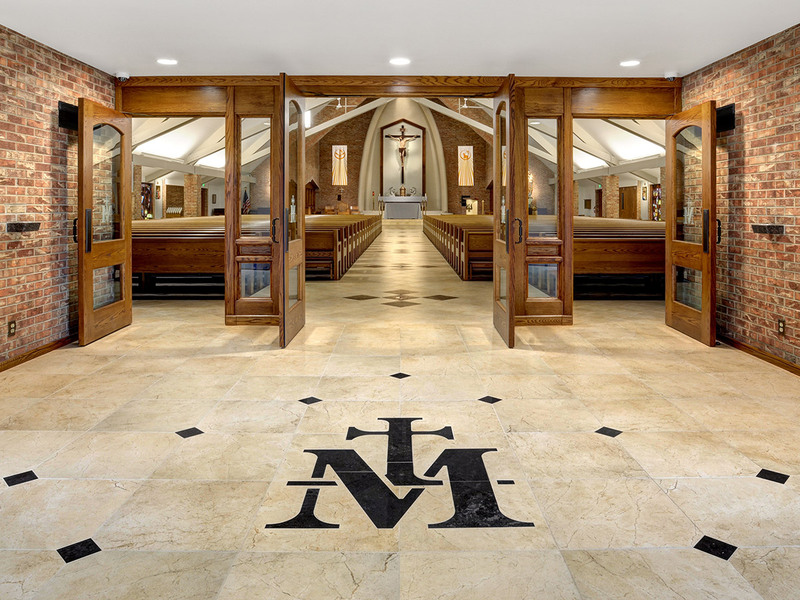 The new design incorporates two beautiful icons - each more than 8 feet tall - which were already present in the chapel, and from which the chapel receives its name. 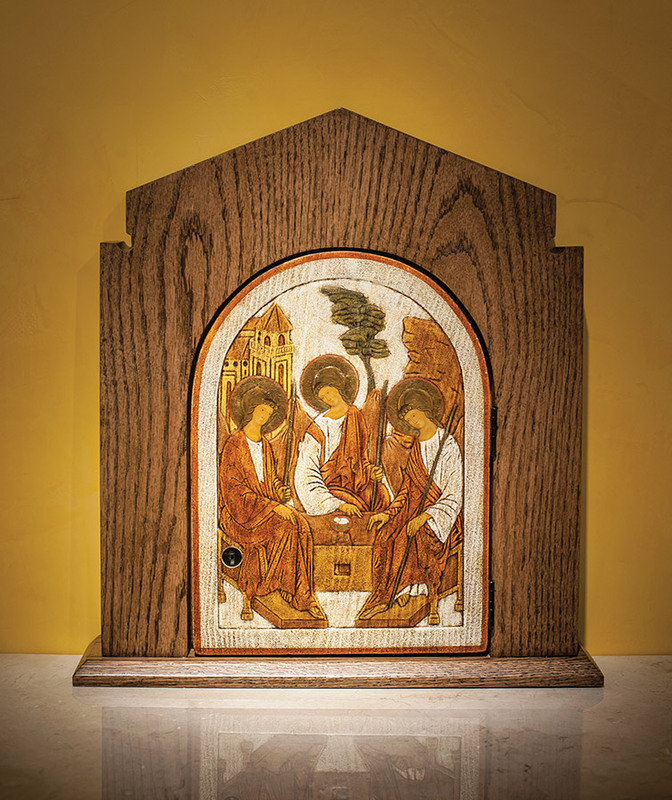 These traditional Byzantine-style icons, worthy in their own right, served as a source of inspiration for the project. 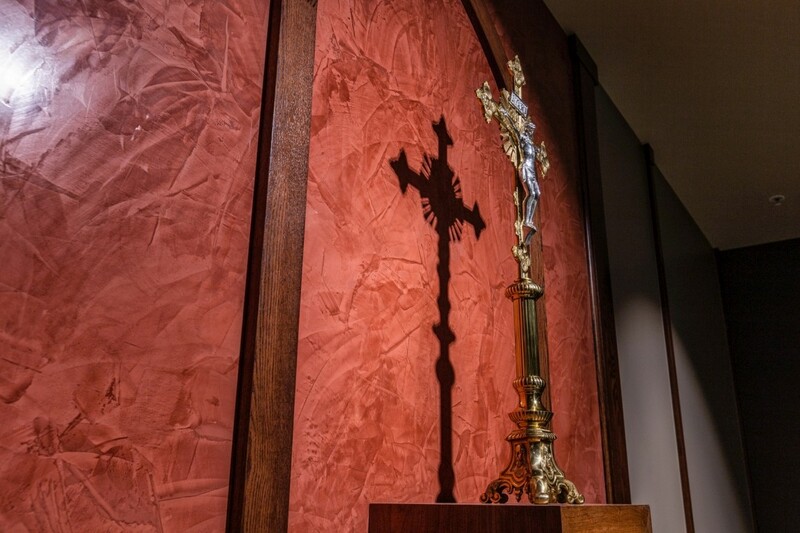 They focus the attention of the worshipers toward the altar and monstrance, presenting the Host for Adoration. 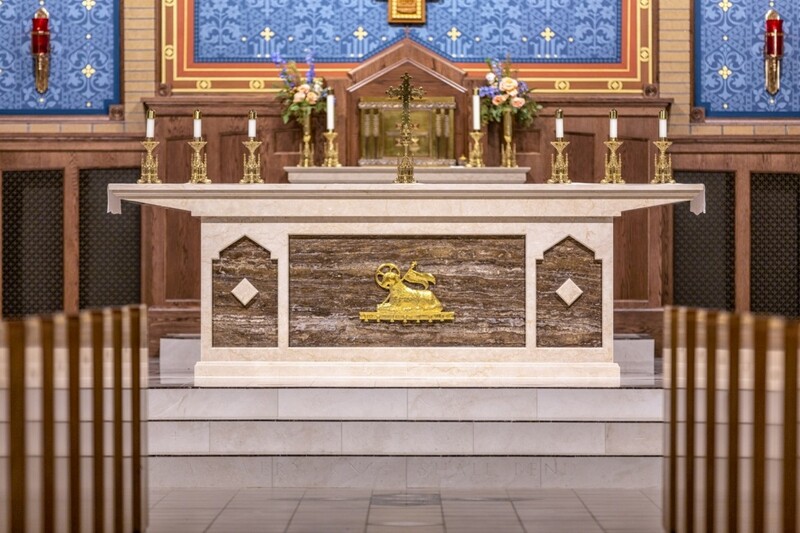 Integration Design Group was responsible for the design of the new custom carved stone Altar, new decorative reredos with red onyx tile niches, new stone and wood altar rail with gold leaf engravings, new tile flooring, updated and integrated lighting, new paints, and new pews. 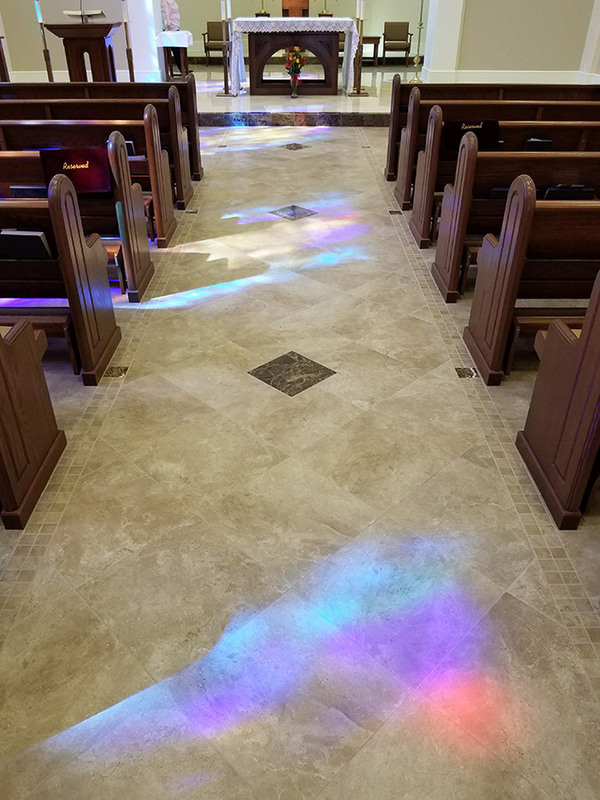 Other aspects included an upgraded ventilation system, revised entrance windows, a new roof, and the addition of a new accessible restroom near the chapel entrance. 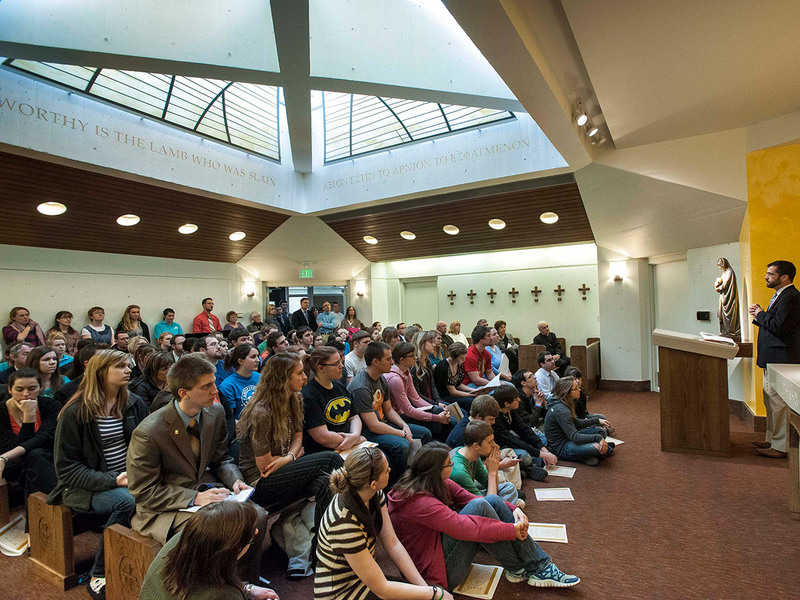 Benet Chapel is located at the heart of the University of Mary campus in Bismarck, North Dakota. 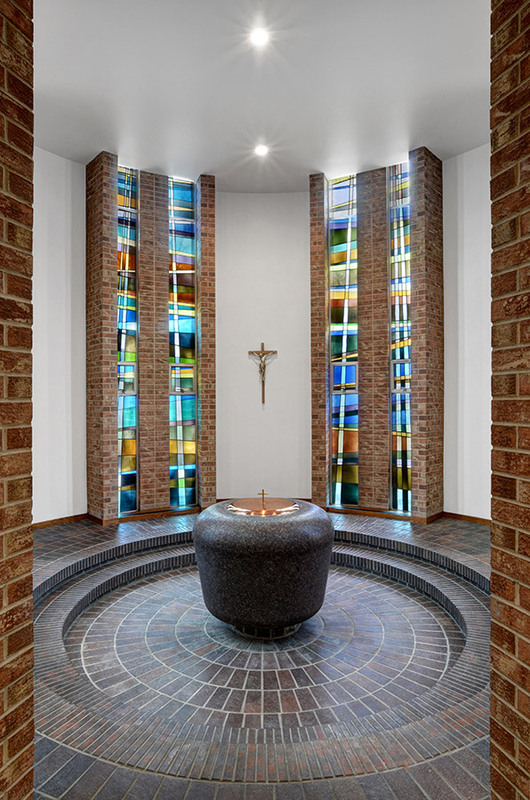 The original design was lacking in beauty and clear organization. 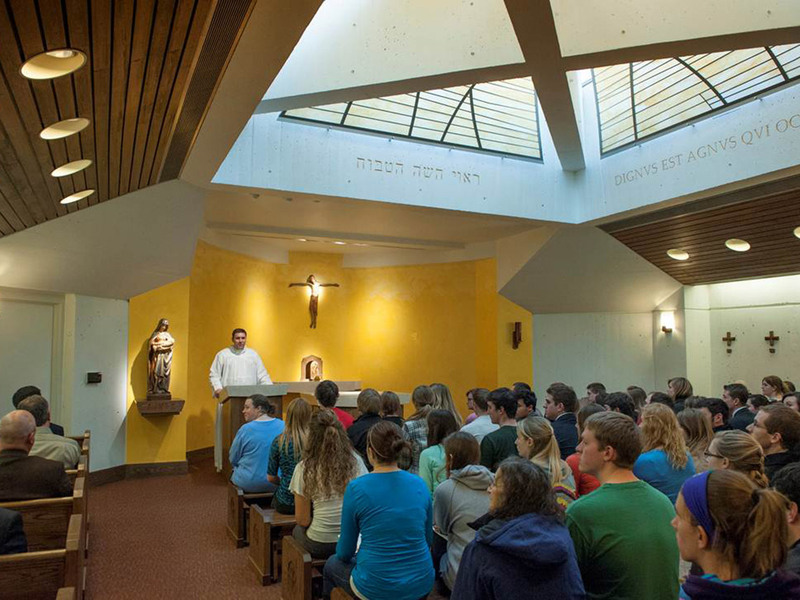 Integration Design Group was asked by the University to propose an entirely new vision for the chapel. 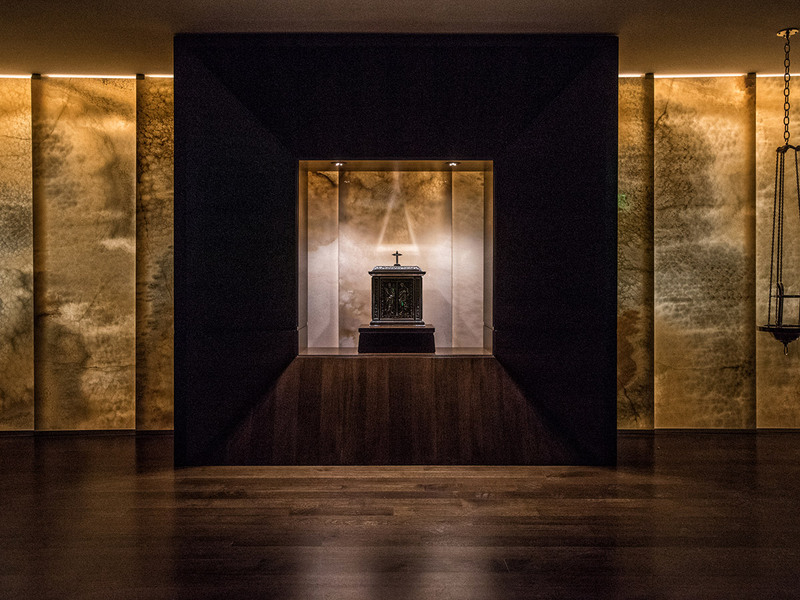 The chapel is now visually grounded by a rich gold wall of venetian plaster in a particular mix of colors. 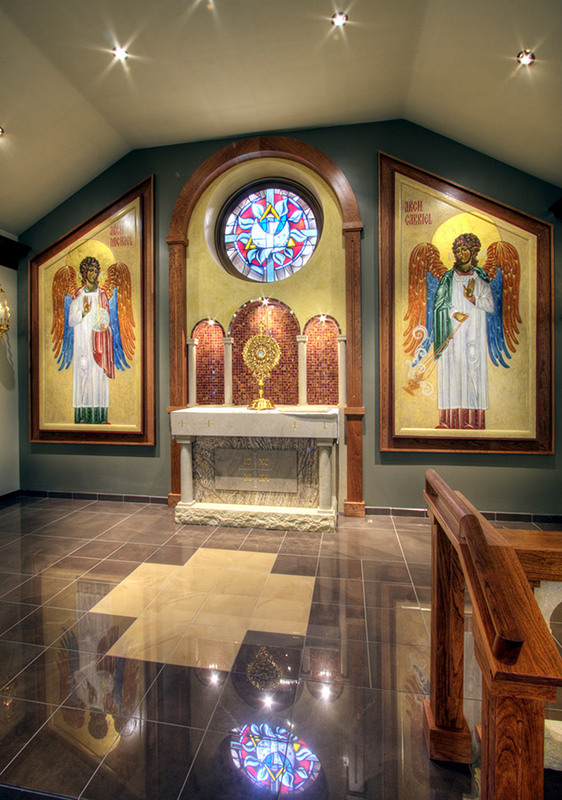 New artwork was commissioned and includes a new tabernacle door which depicts the visitation of the angels to Abraham. 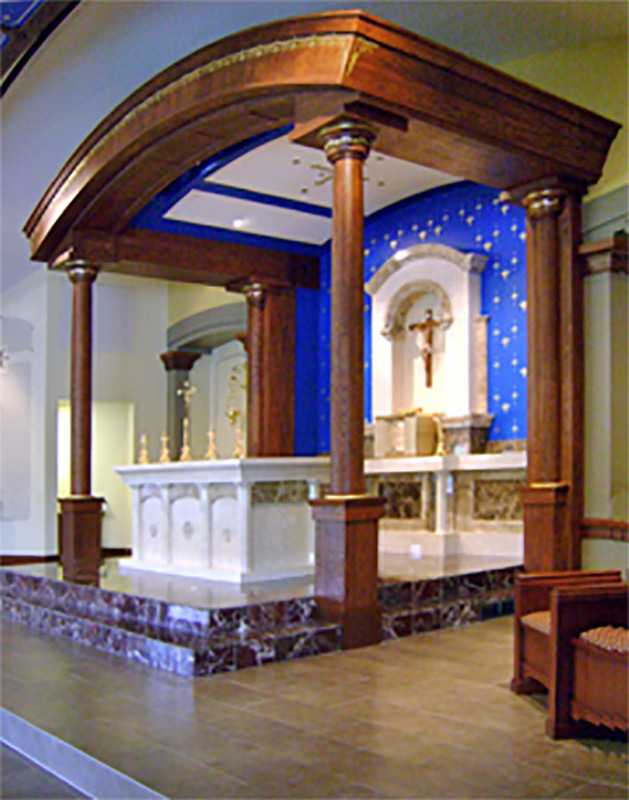 IDG designed new liturgical furnishings, altar, ambo, pews, and benches, and stations of the cross. 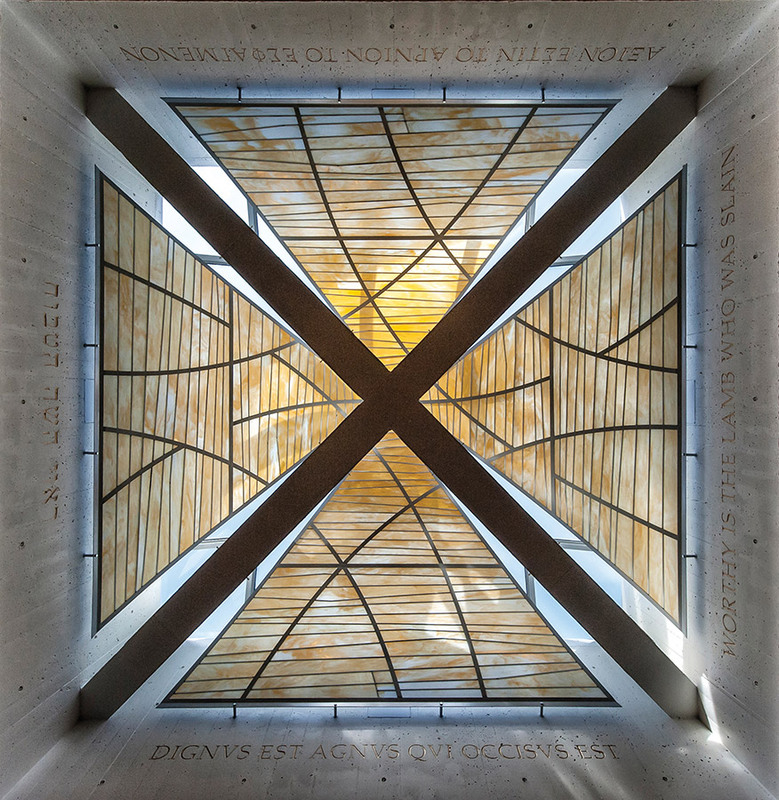 The existing skylight was modified to receive a new artistic installation of hand-made colored glass to filter the bright daylight from above. 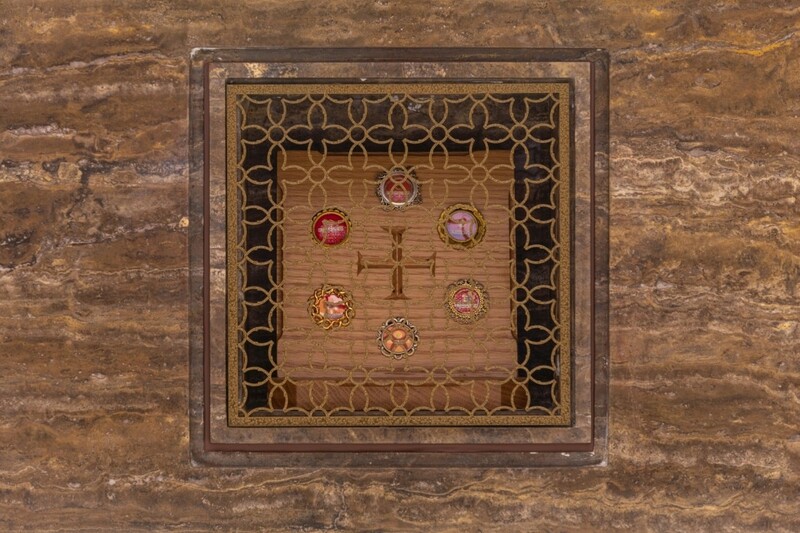 IDG worked closely with a glass artist from Santa Fe, New Mexico on this unique piece. 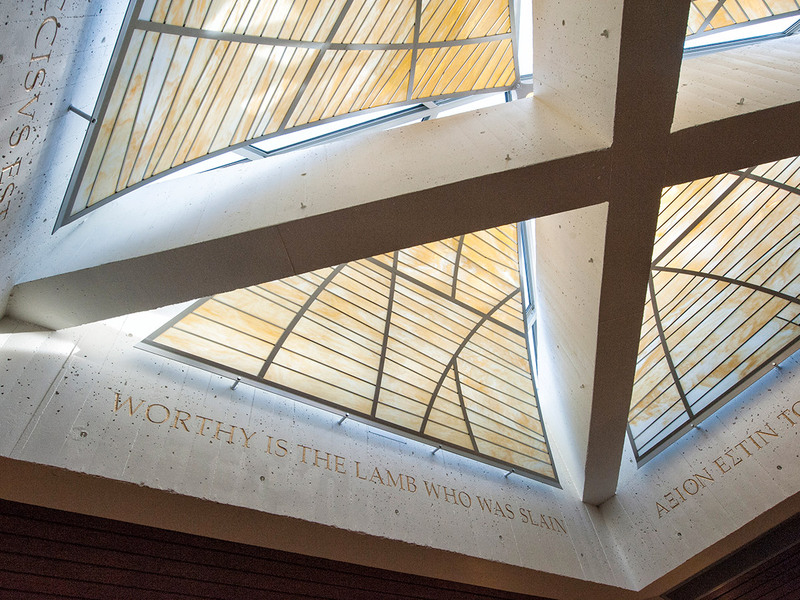 Around the skylight is inscribed the text, "Worthy is the Lamb who was slain" in English, Latin, Greek, and Hebrew - thus calling to mind the great liturgical hymn of praise sung by the angels in the Book of Revelation. 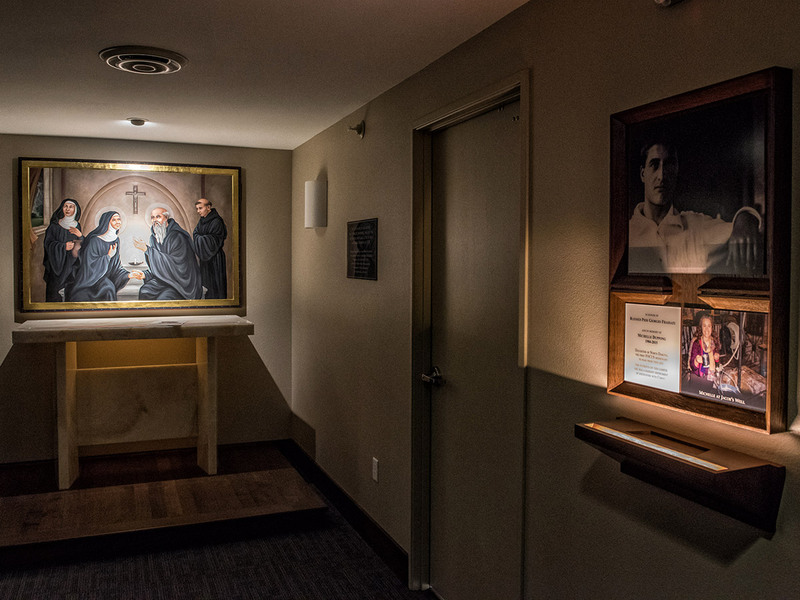 In anticipation of the 1OOth anniversary of the Little Sisters of the Poor serving the elderly in Denver, they undertook a complete renovation of their chapel in the historic Mullen Home facility. 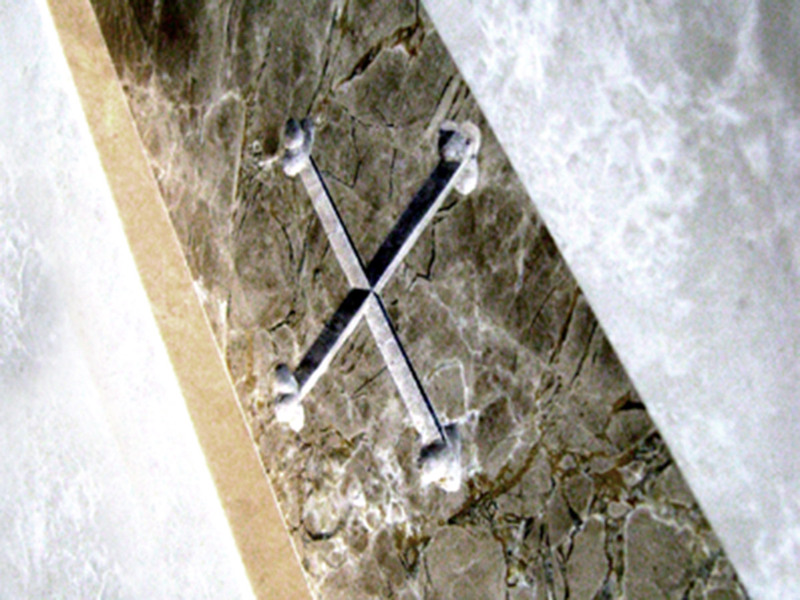 Integration Design Group restored many of the historic elements that had been covered over in recent remodel efforts. 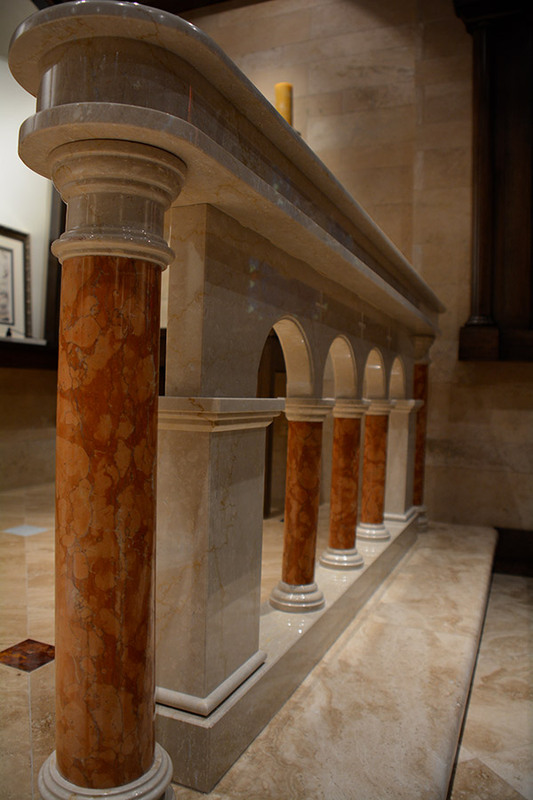 A new barel vault was constructed, and the dome above the sanctuary was recovered. 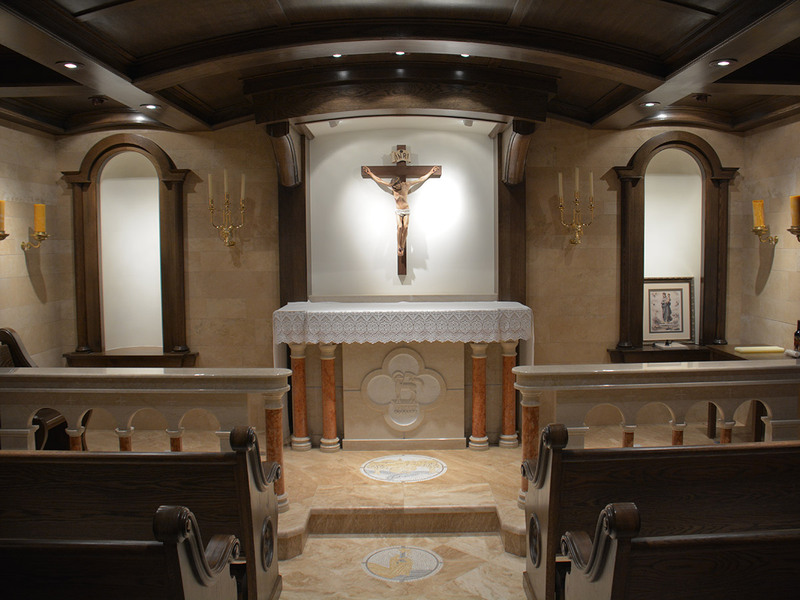 The resulting design is very clean and classical, with understated details and color palette. 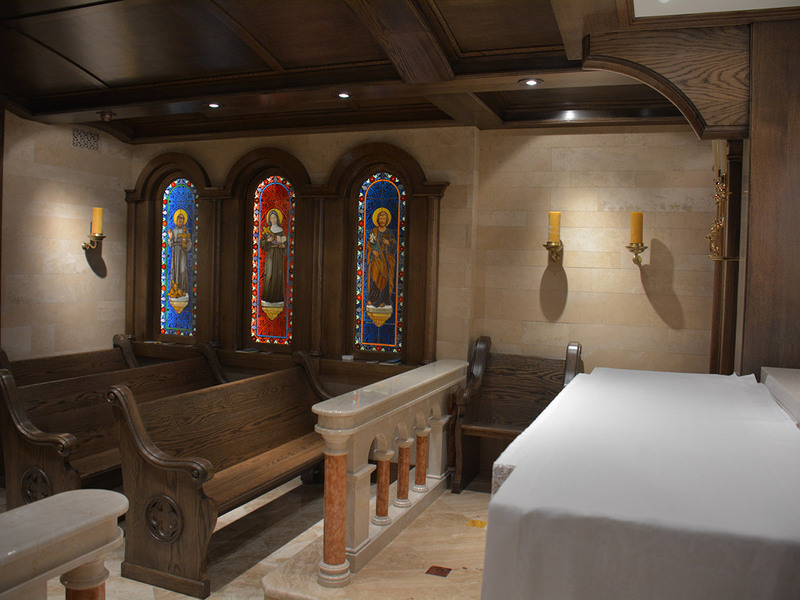 The project included all new finishes, new pews and liturgical elements, remodeled sacristy spaces, and confessionals. 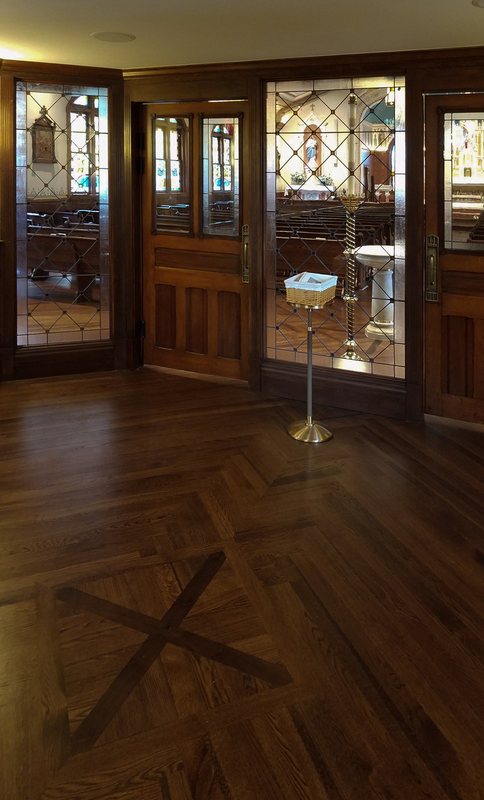 New doors and a new ambry for the holy oils were installed. 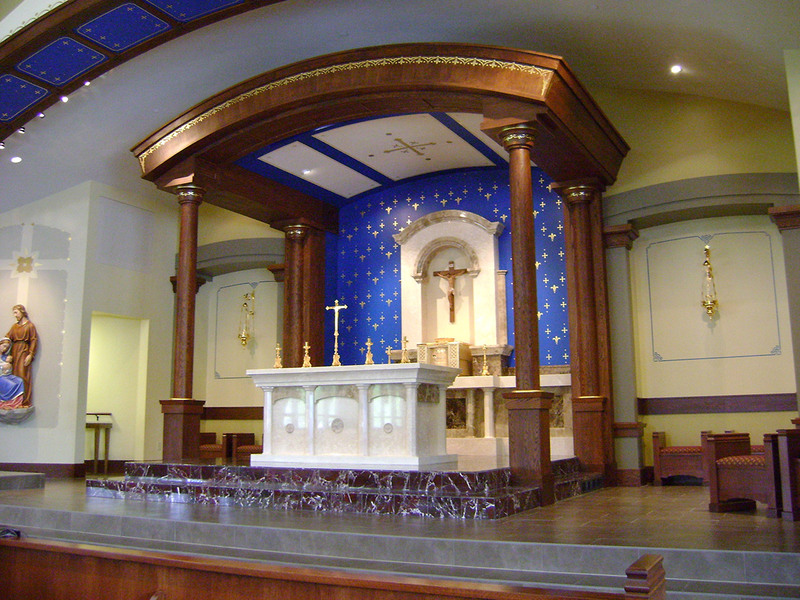 The lighting scheme highlights the deep chancel and the dramatic arch with the tabernacle pedestal and simple crucifix at the center of the composition. 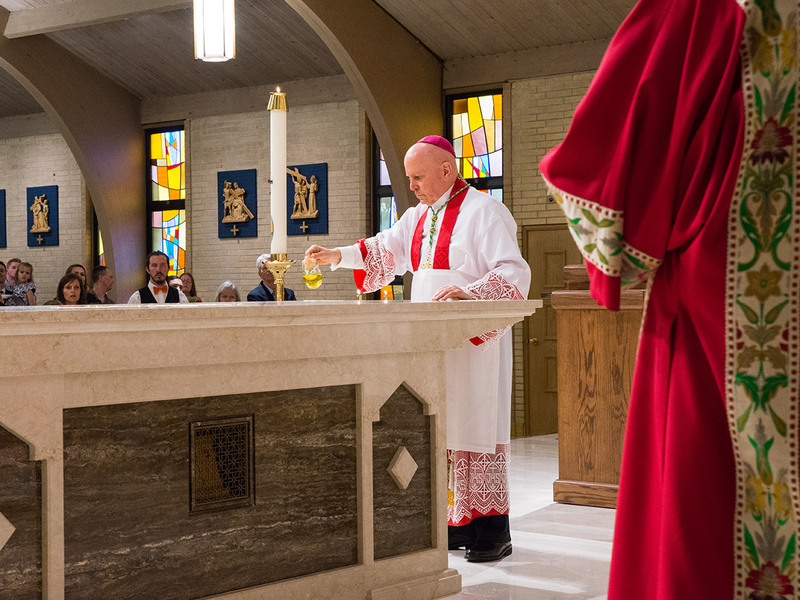 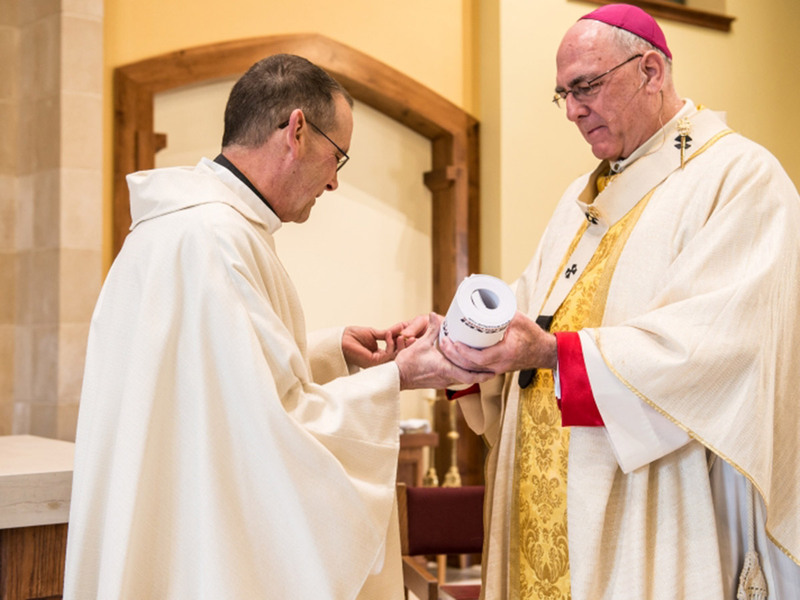 This growing parish just west of the Kansas City metro area fulfilled a longstanding hope of constructing a new church building. 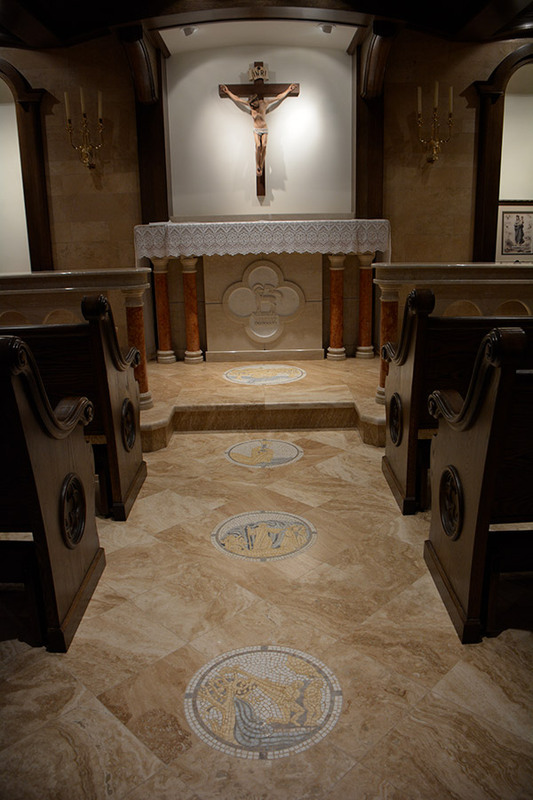 The basement level of the parish education building had served as their liturgical space for almost fifty years. 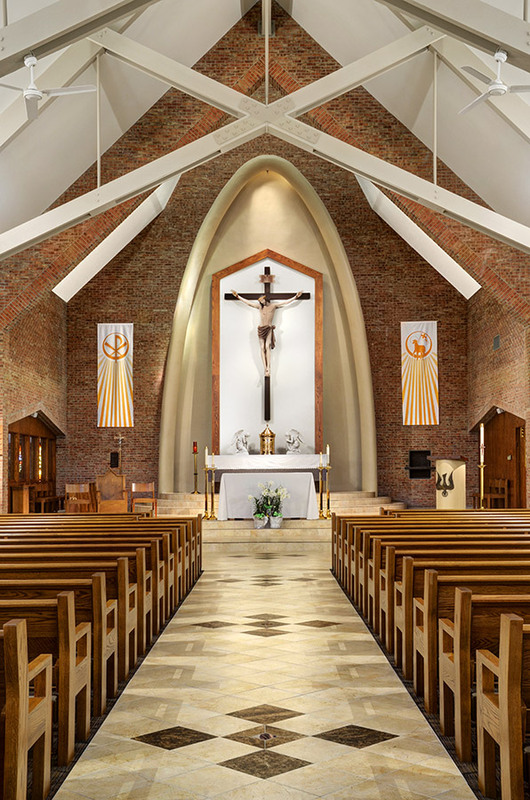 IDG partnered with a local design firm to provide master planning services, and then proceeded to lead the design effort for the new church building. 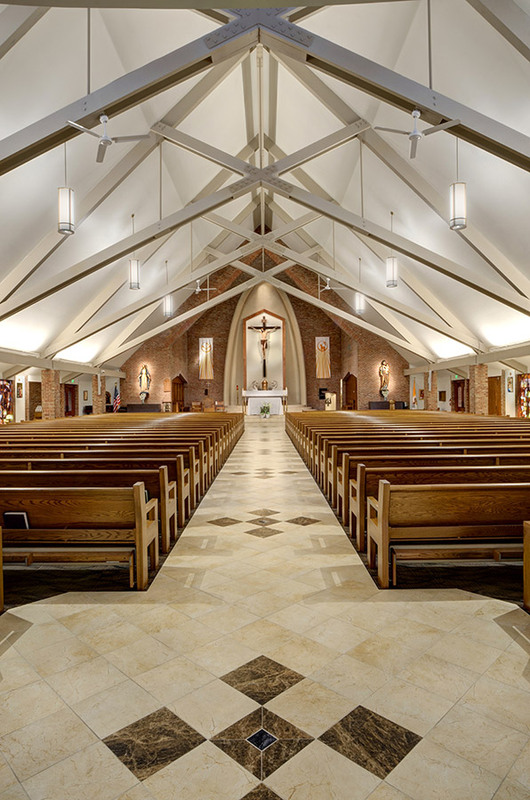 Included in the scope is a church to seat 550 occupants in a traditional cruciform configuration, with a large narthex and forty-foot tall ceilings. 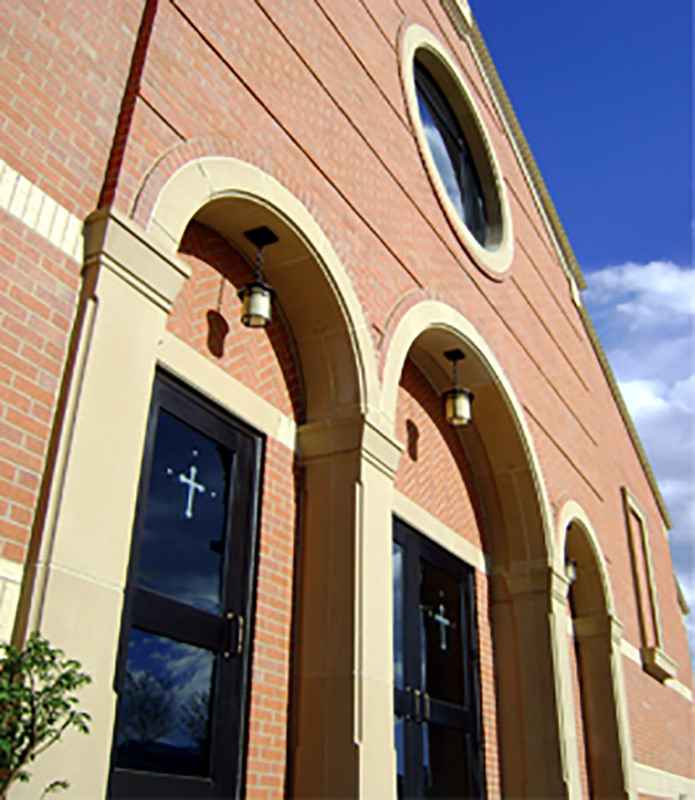 Substantial site work was necessary to accommodate the new building and parking requirements. 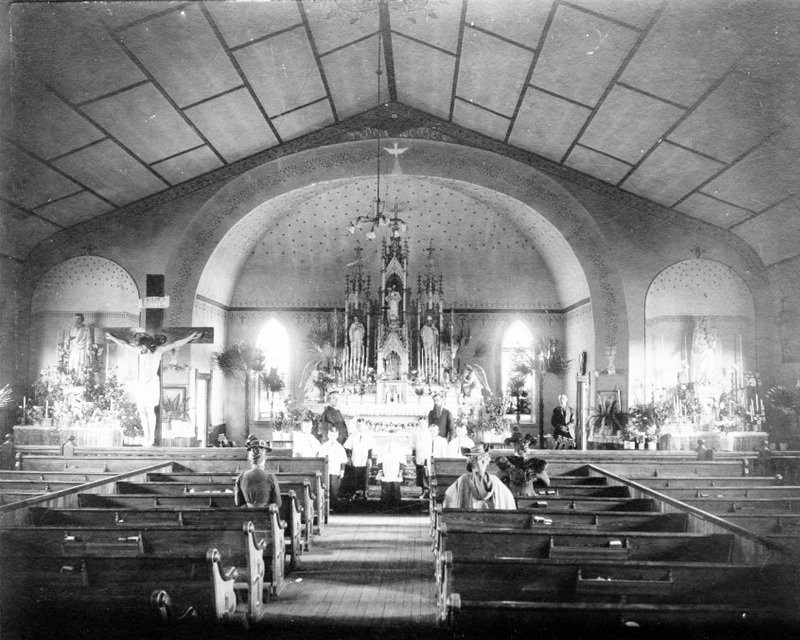 The lower level of the building was left unfinished for a later phase of classrooms and parish offices. 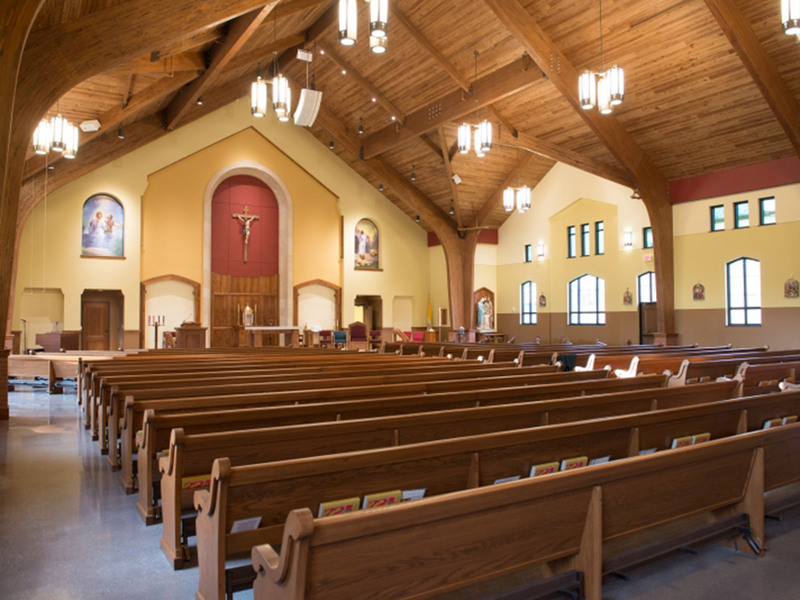 Completing their Master Plan vision established in 2005, the parishioners at Our Lady of the Valley needed to build a generous 350-seat fellowship hall, full service kitchen, fourteen new classrooms, a Eucharistic chapel, and a new office suite—all while keeping their current facilities fully operational. 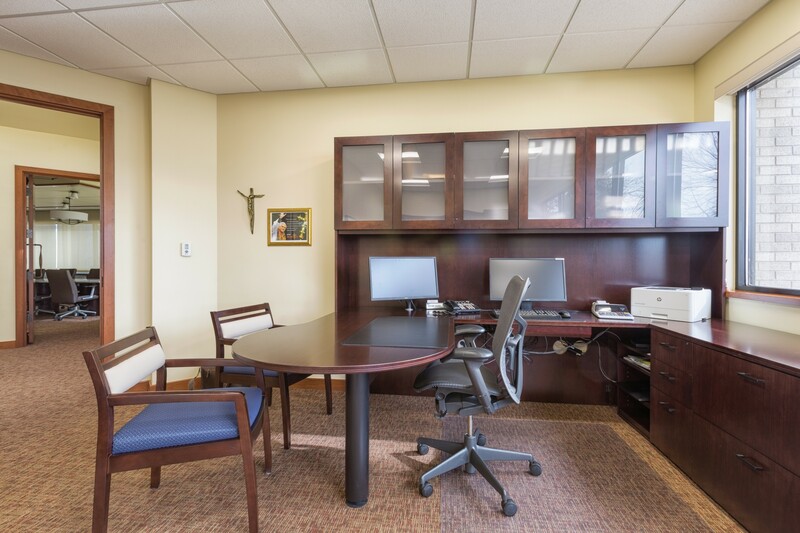 In addition to a full scope of design and planning services, Integration Design Group worked very closely with the General Contractor to develop a strategy for logistics and sequencing—enabling the parish ministries to continue in place during construction. 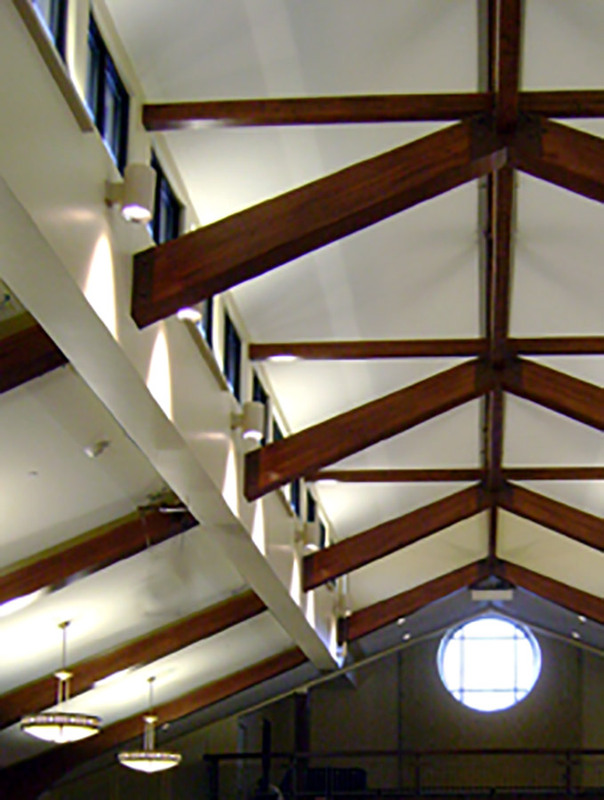 The result is a well-integrated campus of buildings. 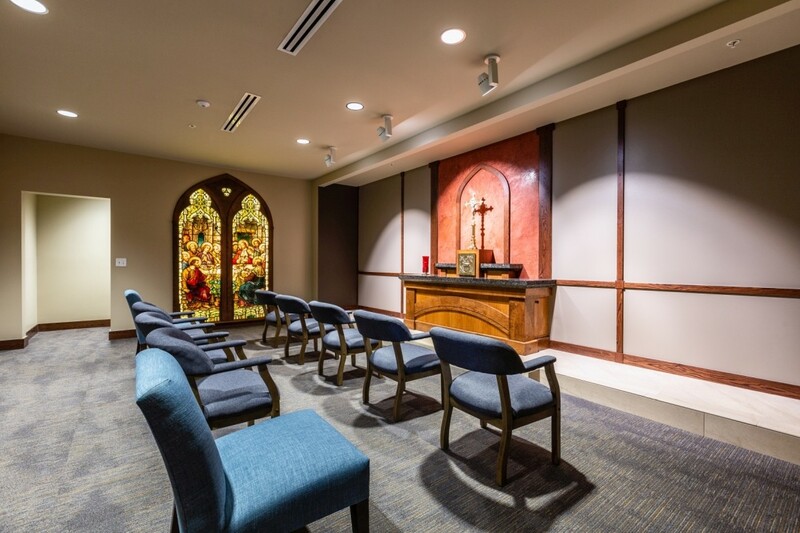 The church has most prominence, and the offices, chapel, classrooms, and fellowship hall connect to it with a consistent aesthetic appearance. 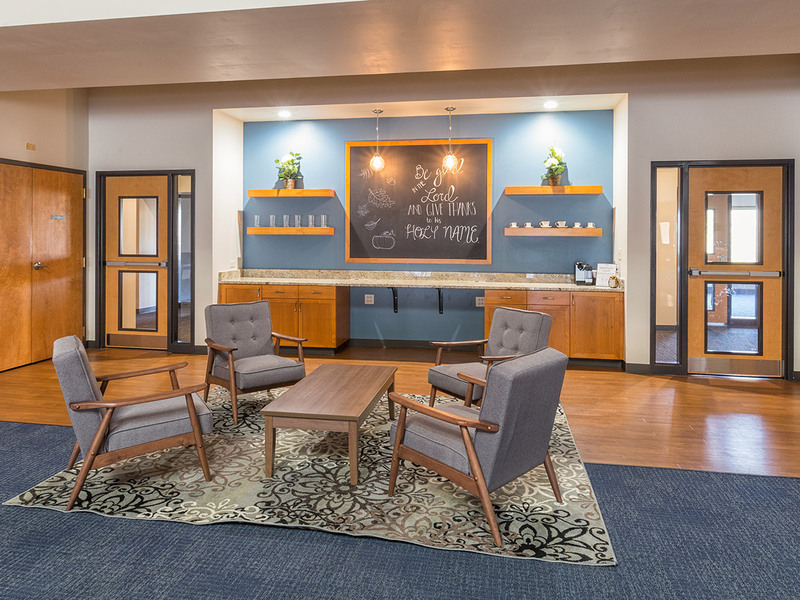 Saint Scholastica Hall is a new residence life community for women enrolled at the University of Mary who have the desire to live in community and grow in faith, character, and holiness. 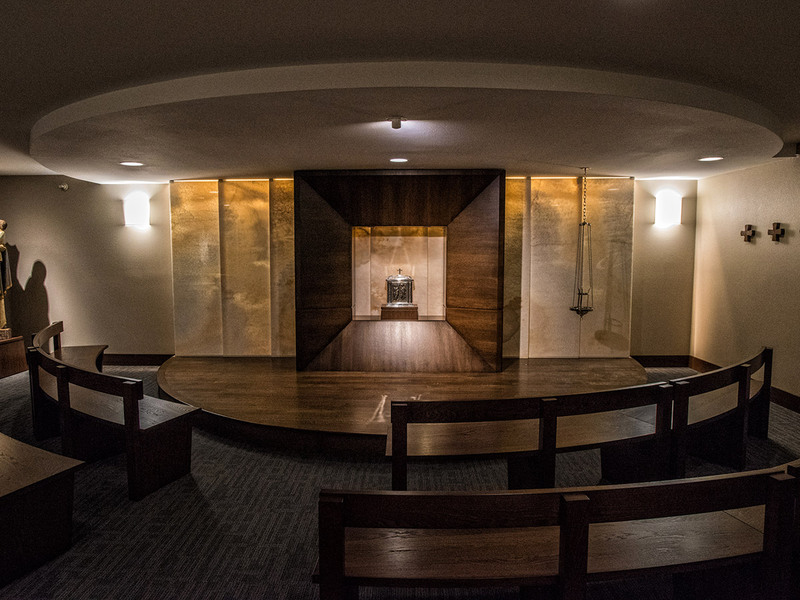 This new chapel is designed to provide a space of prayer and contemplation to support the spiritual life of the residents. 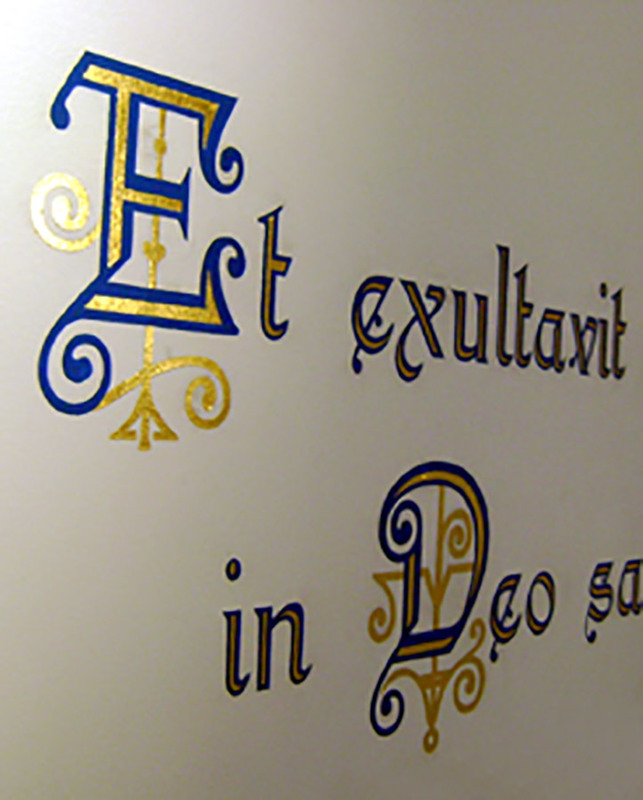 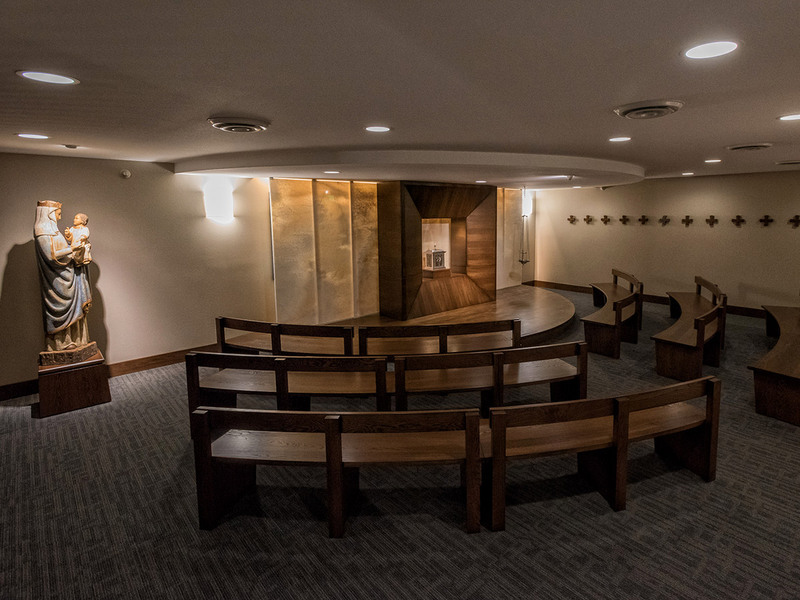 Located on the upper level of the new building, this chapel - named Occursus Domini, the Encounter of the Lord - will accomodate 40 students in a group setting, and is available for personal prayer as well. 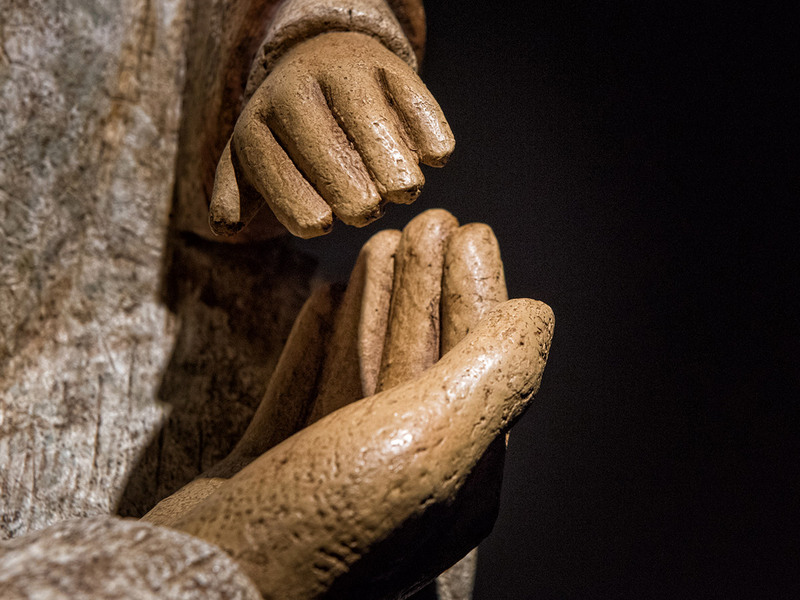 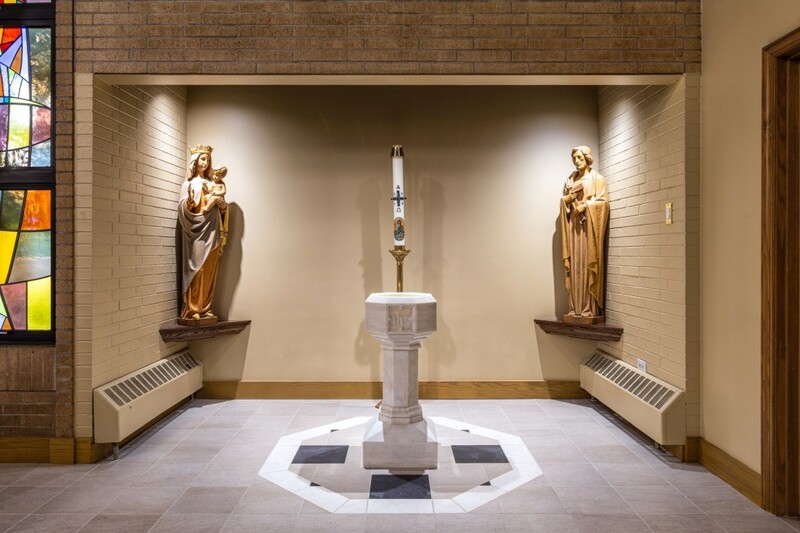 The chapel's primary dedication is to the Woman at the Well, and is focused on the theme of "encounter" - a personal meeting and conversation with the Lord. 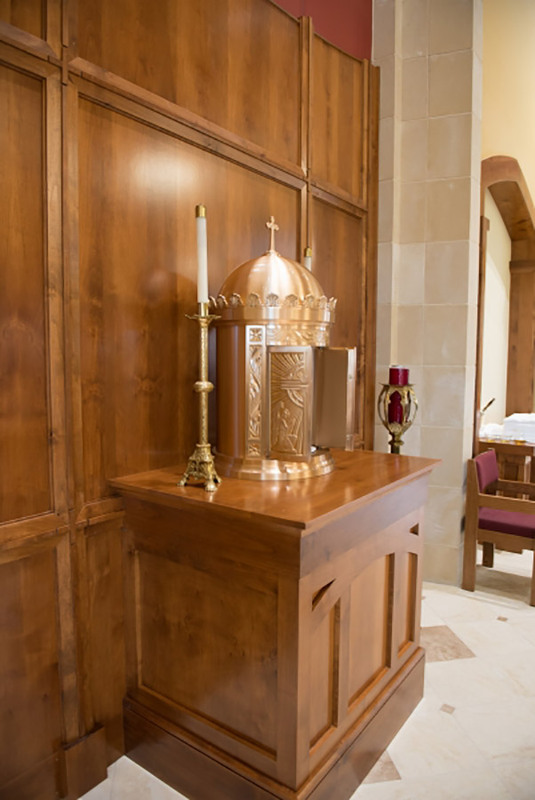 The chapel incorporates a broad wood surround as a frame for the simple tabernacle. 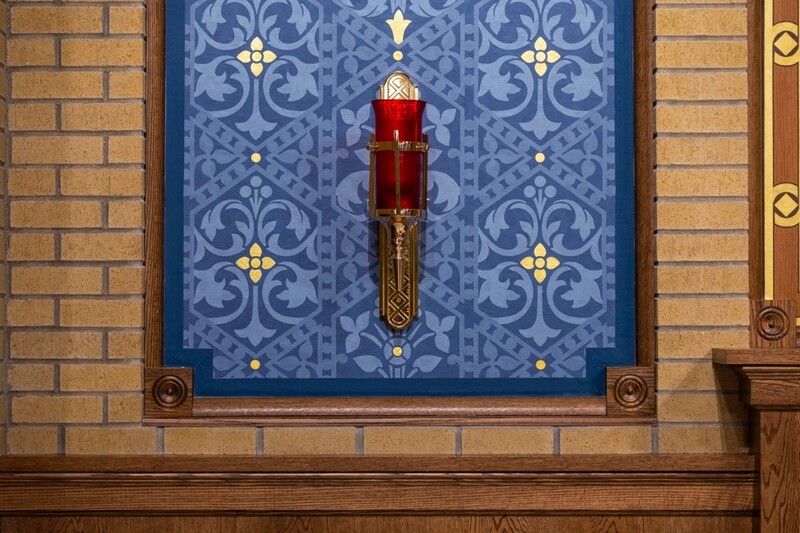 The tabernacle is positioned in front of an alabaster screen. 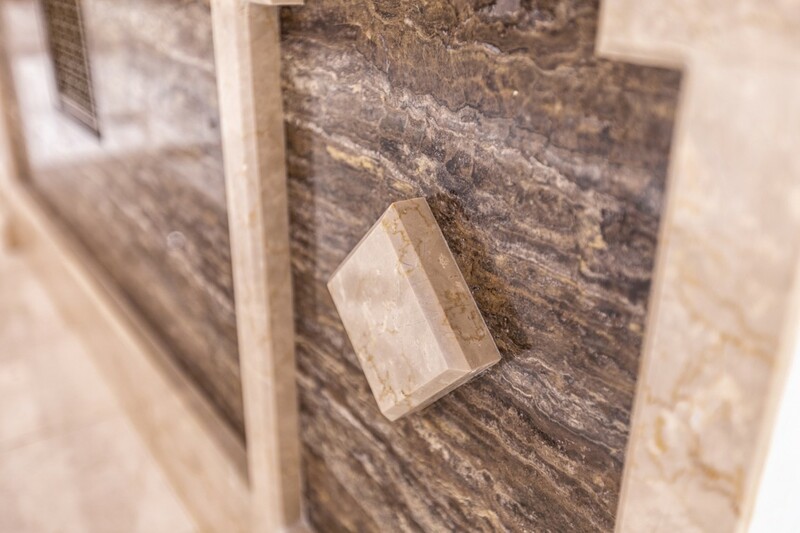 The alabaster panels diffuse the daylight from the windows behind, providing a soft glow. 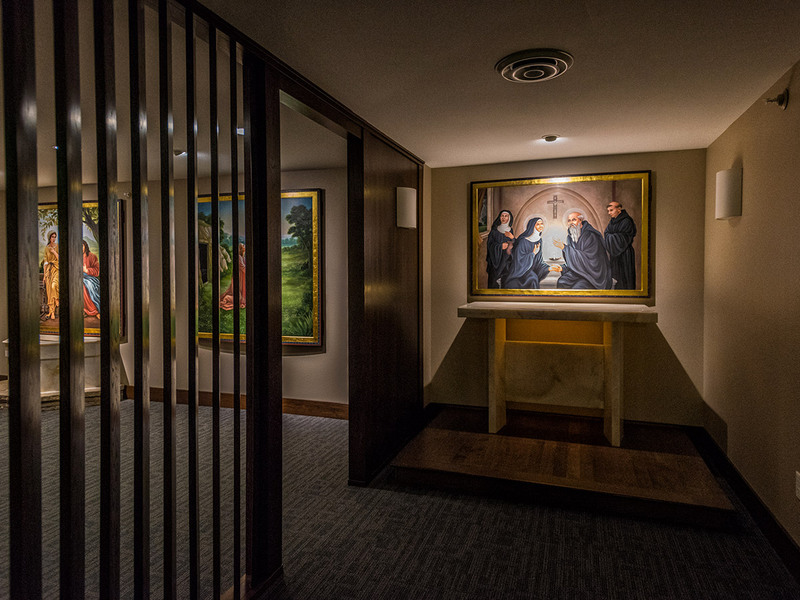 The entry to the chapel offers an extended path, with a wood screenwall allowing for a transition from the active space of the residence hall into the contemplative space of the chapel. 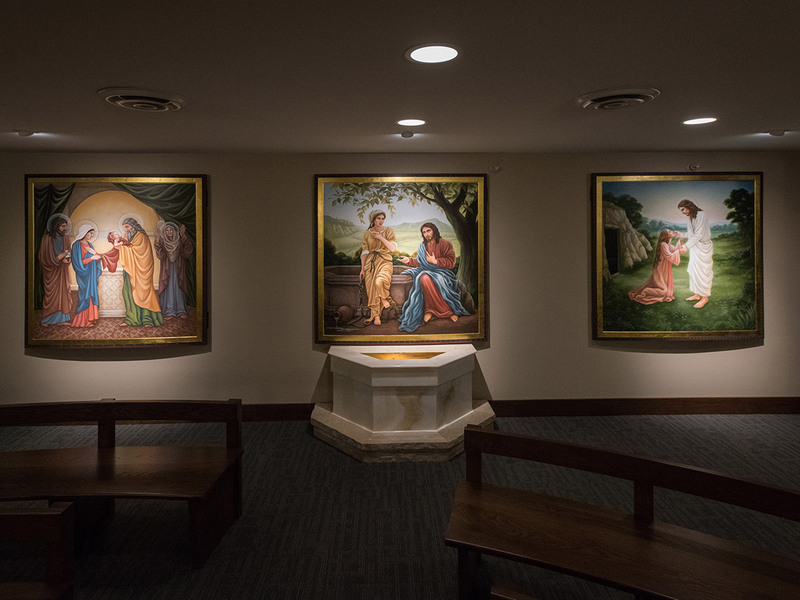 As they enter the chapel, students find a space that focuses attention on the tabernacle, supported by commissioned iconography of three encounters - the Woman at the Well, Simeon in the Temple, and Mary Magdalene at the Tomb. 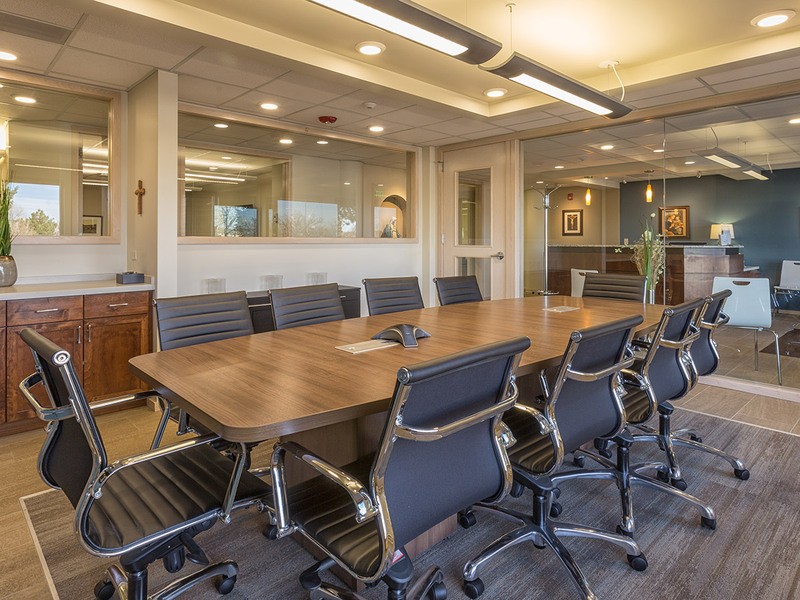 Having occupied the same office space for thirty years, the largest Catholic credit union in Colorado asked IDG to envision an entirely new design. 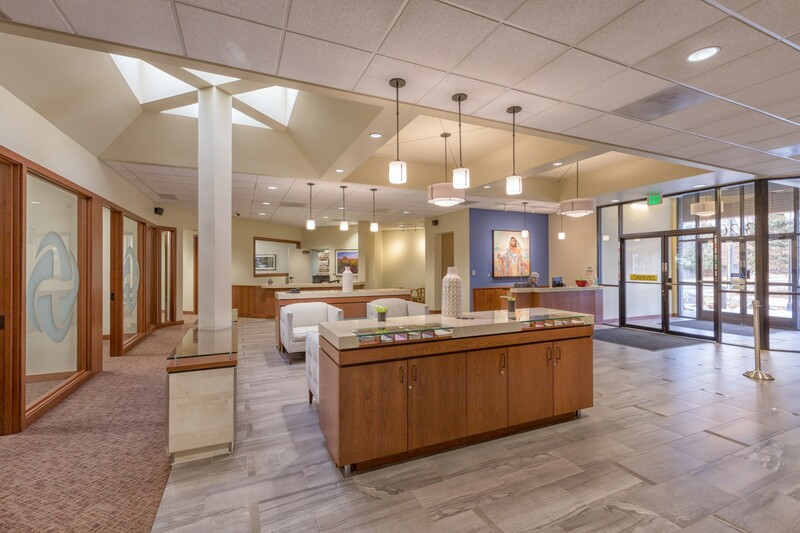 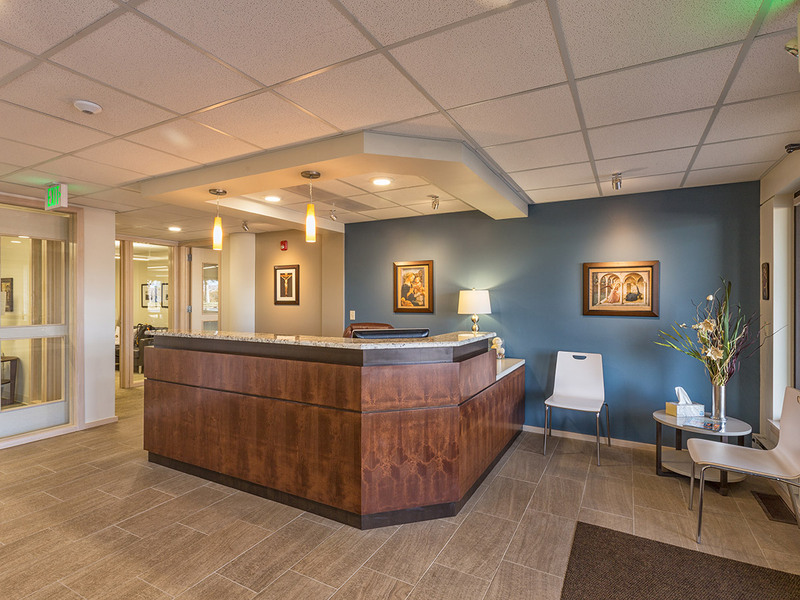 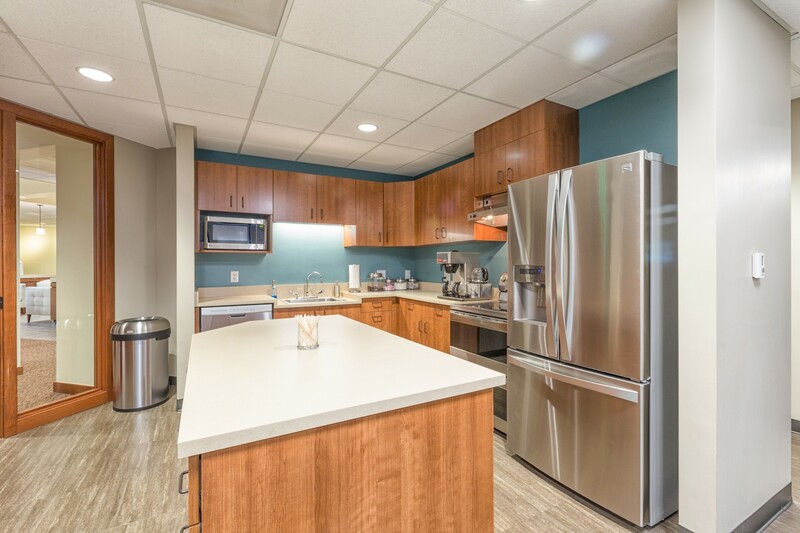 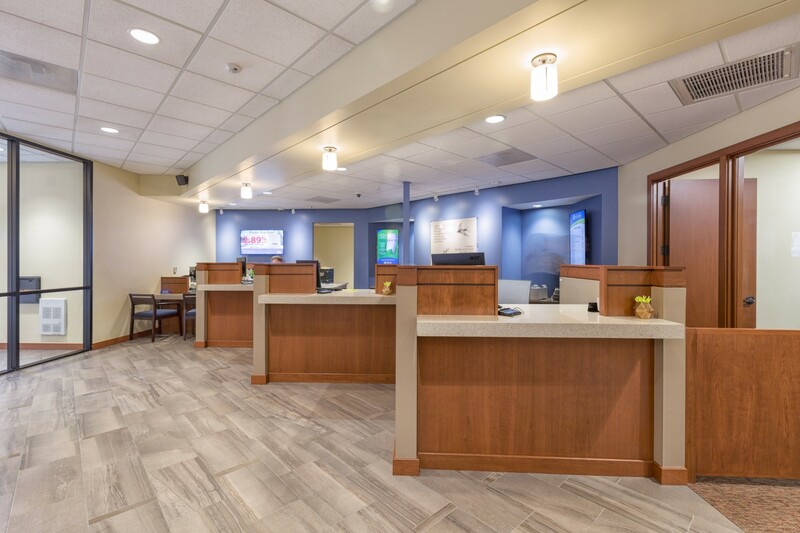 With extensive experience serving financial institutions, Integration Design Group developed a complete interior remodel for Fidelis Catholic Credit Union. 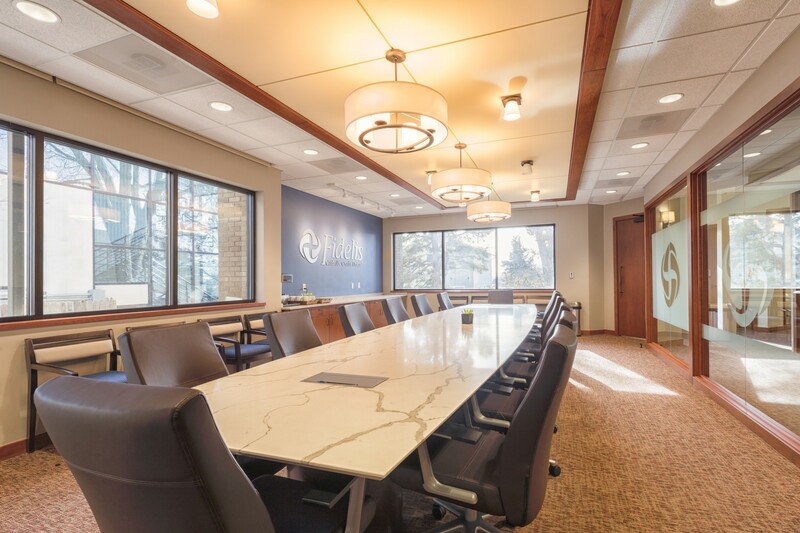 The project coincided with the re-branding of the organization, and we worked closely with the leadership team to ensure the new architectural design fit well with the new vision. 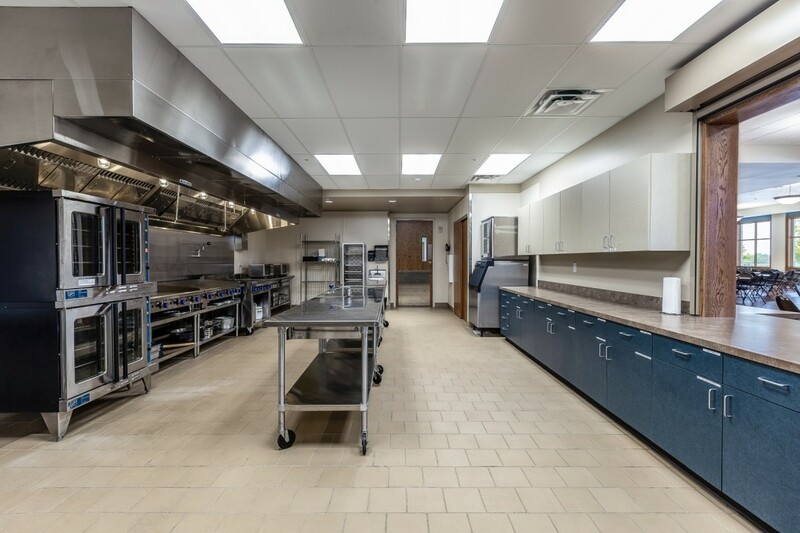 Our team worked very closely with the General Contractor to coordinate budget and phasing logistics, allowing the facility to remain open and operational throughout construction. 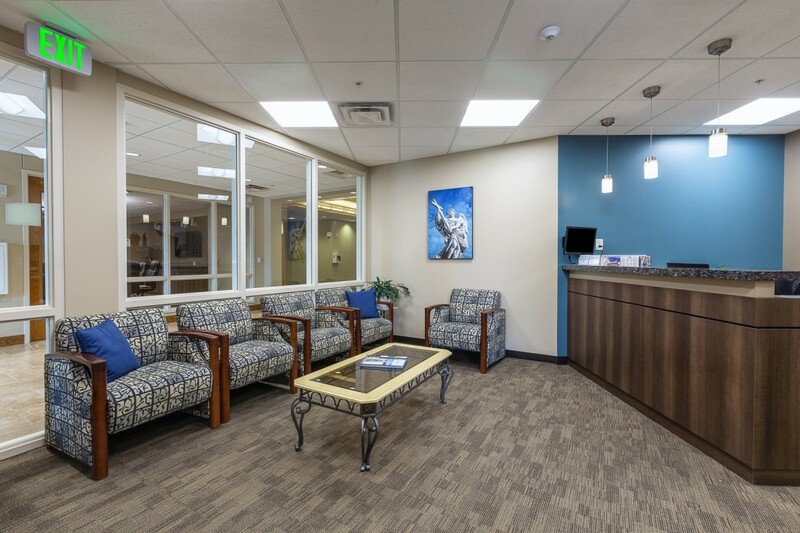 The result is a fresh and updated feel allowing the staff to work well as a team and better serve its membership. 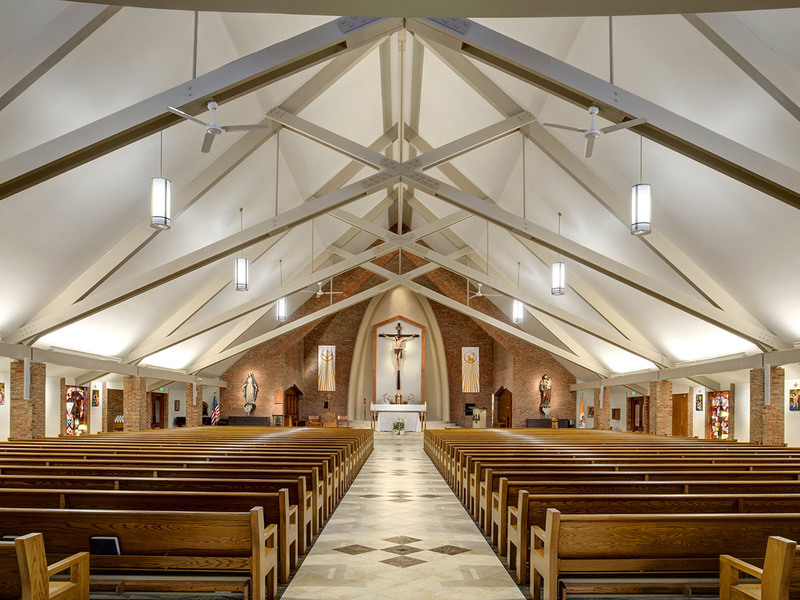 As St. Mary parish approached the 50th anniversary of the construction of their church building a portion of the ceiling collapsed. 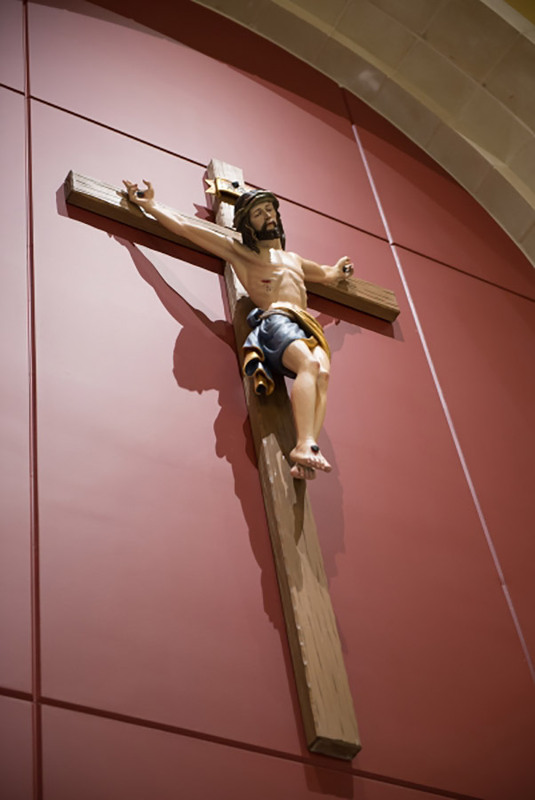 This prompted not only the repair of the ceiling, but a thorough renovation of the church interior including new pews, lighting, paint, flooring, doors, crucifix and reredos. 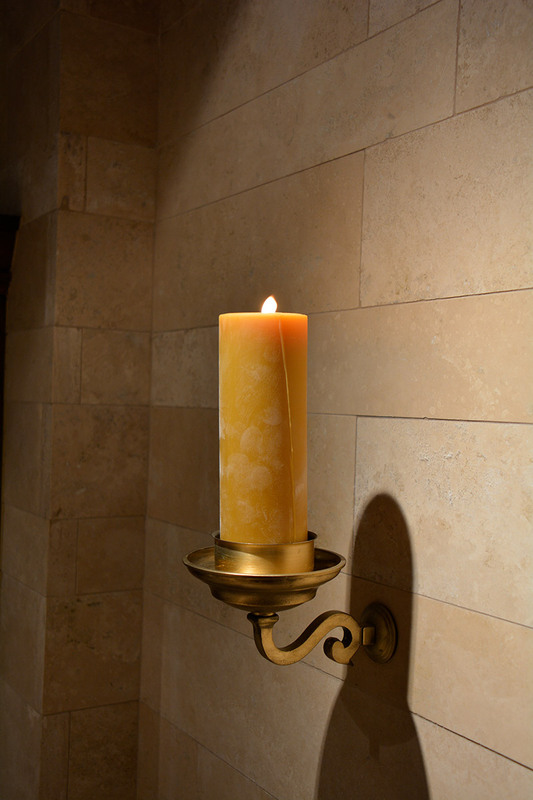 New ADA compliant restrooms were added in the narthex. 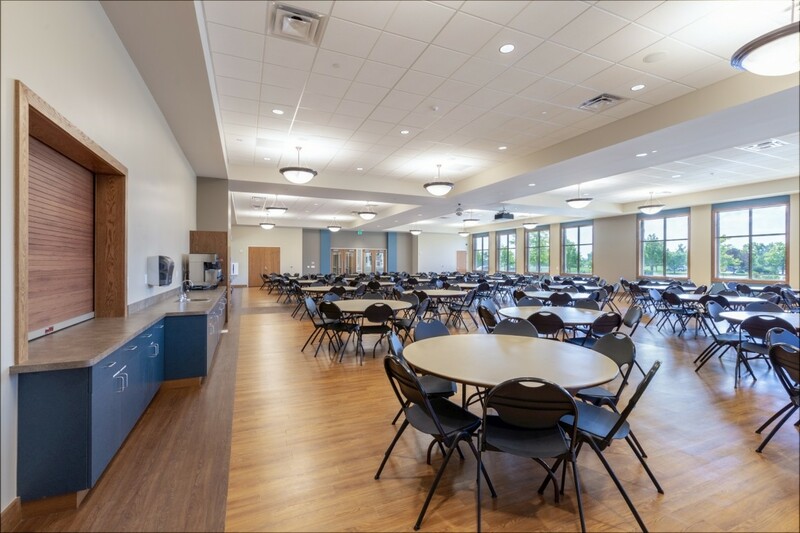 IDG provided design guidance for all aspects of the project, including coordination of engineering consultants, and careful oversight of the construction process. 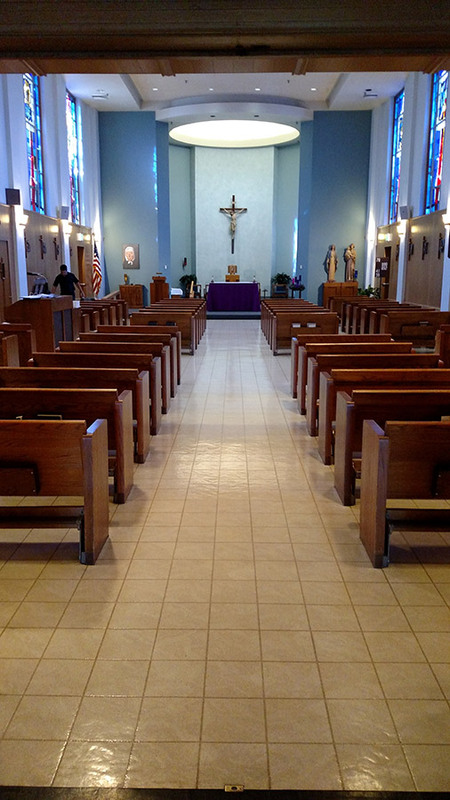 The church interior was brightened with a new paint scheme in which the dark roof trusses were painted, and the ceiling and walls received a new lighter color as well. 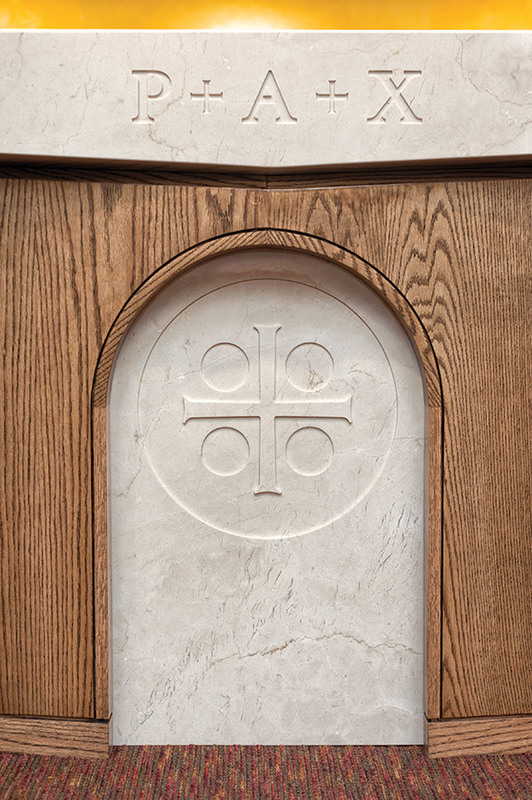 Behind the altar, a new reredos panel was constructed in front of the existing parabola element to properly frame the new crucifix. 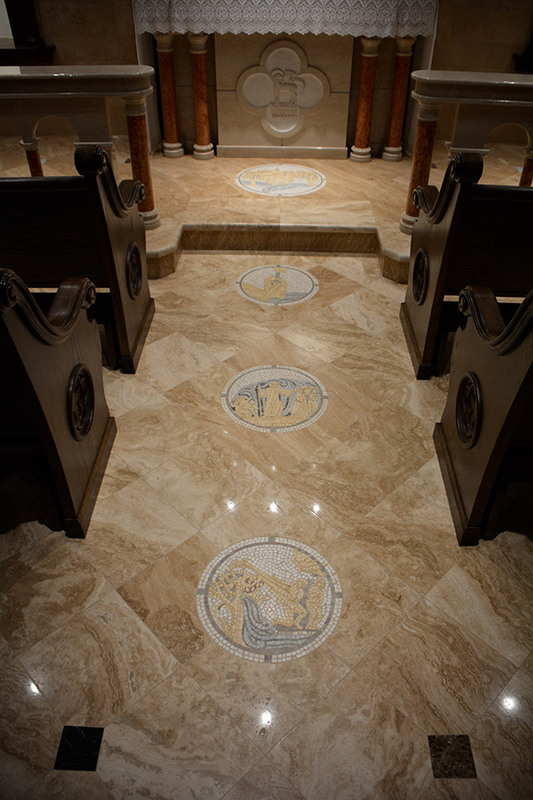 The floor pattern at the narthex, with the parish insignia in bold blue tile is a highlight of the project. 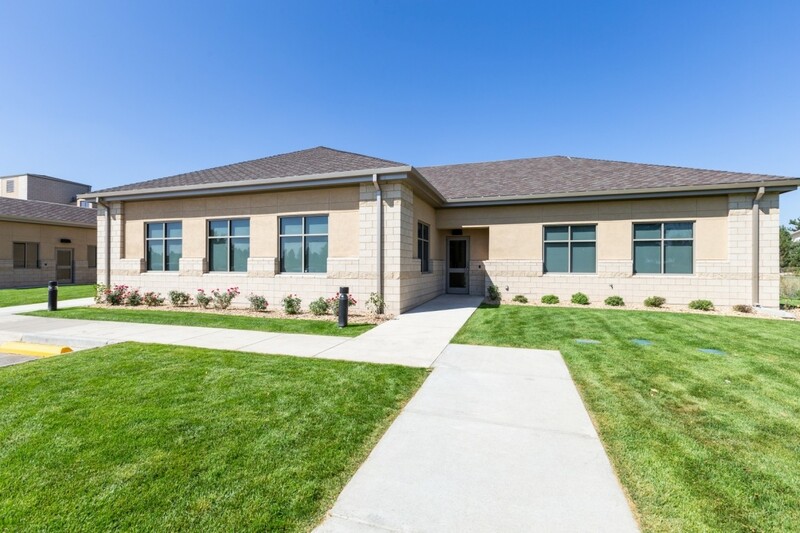 General facility improvements included roof replacement, site lighting, sidewalk replacement, stromwater drainage, etc. 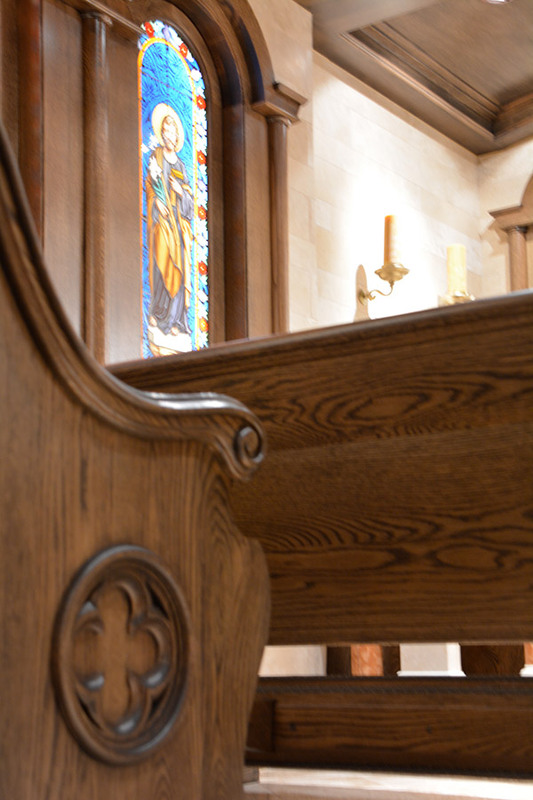 A quiet place of prayer in the heart of a busy university campus. 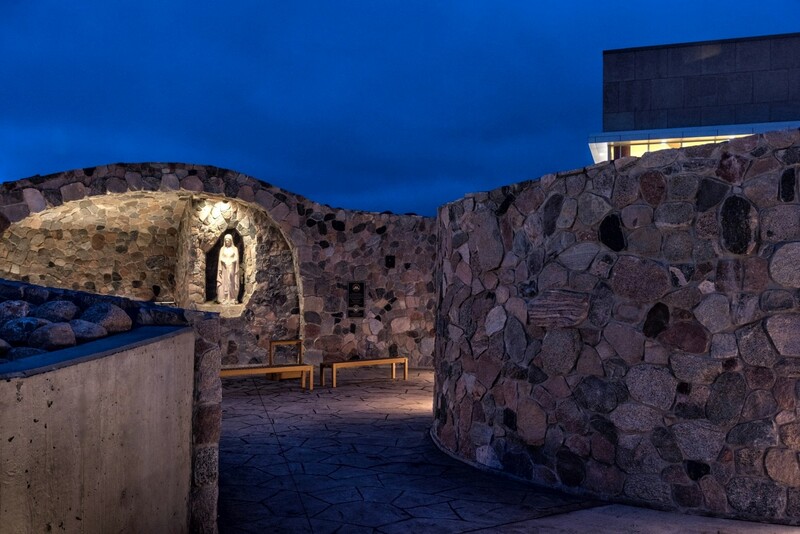 This new Marian Grotto in set into a hillside overlooking the broad Missouri River valley to the west. 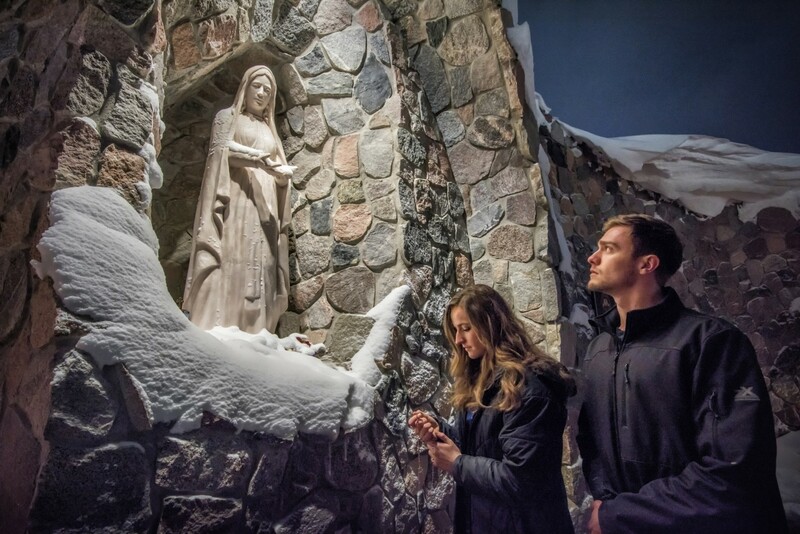 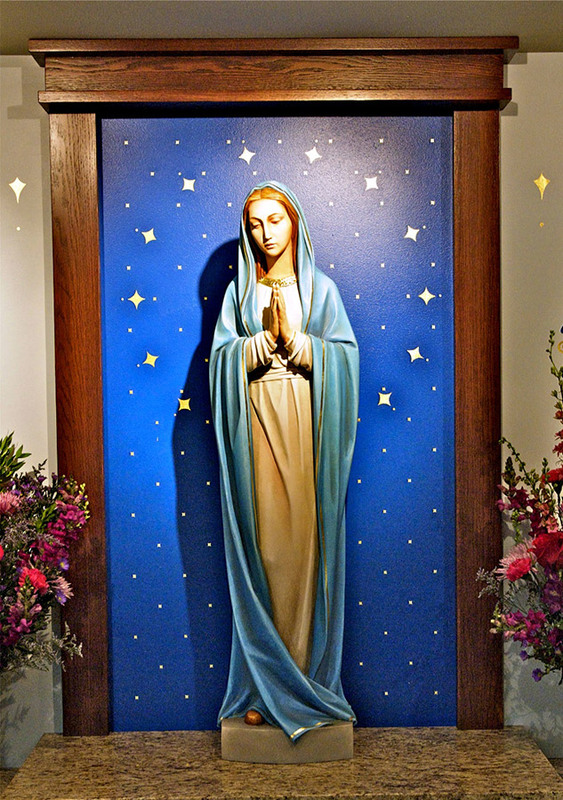 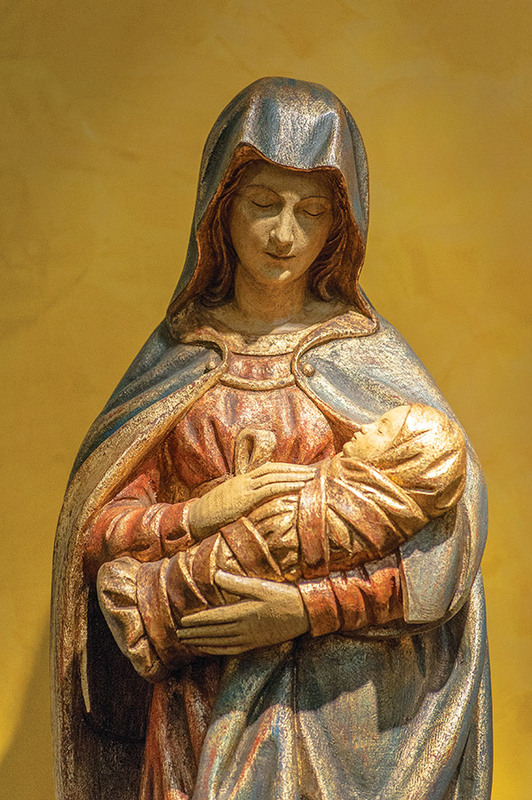 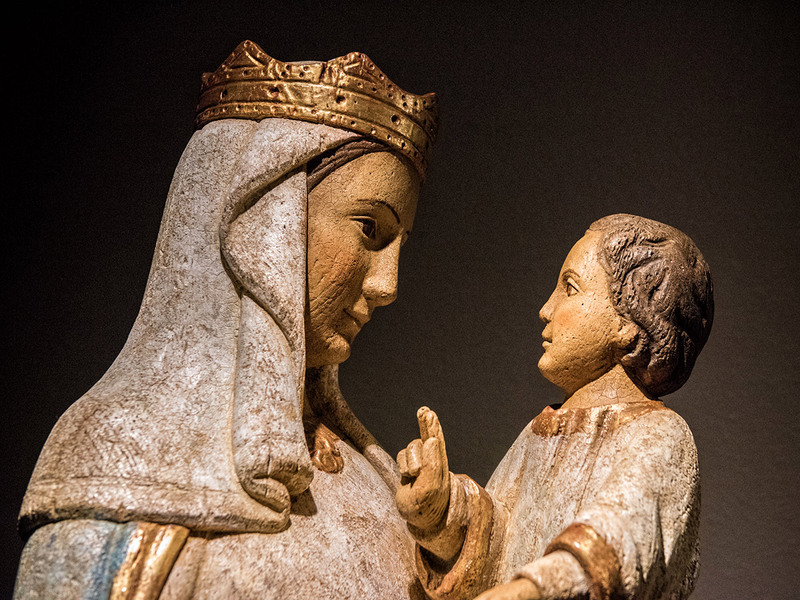 At the University of Mary a vision was put forth to establish a grotto as a place of dedication of Our Lady, for personal devotion, and small group prayer. 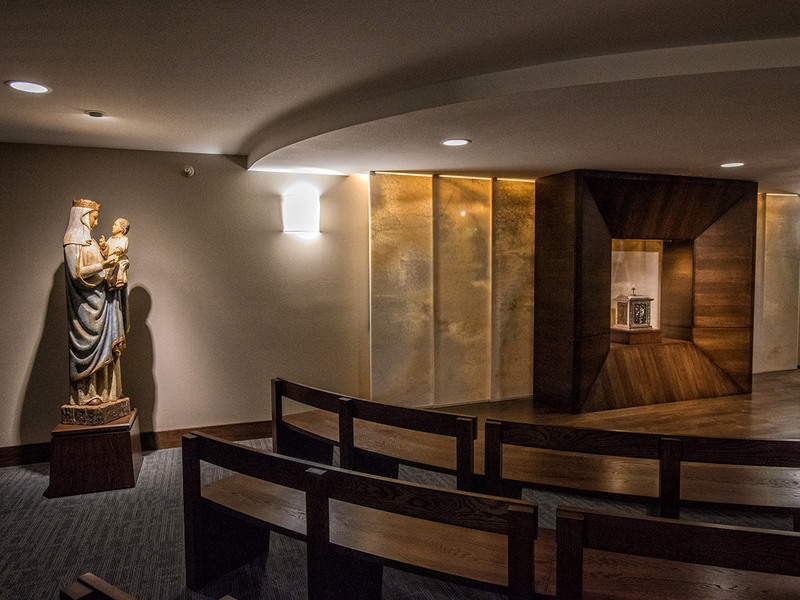 Centered on a new statue of Our Lady of Lourdes, specially commissioned for this project, the grotto has integrated spaces for students, staff, and guests to rest, pray, kneel, and light candles for particular intentions. 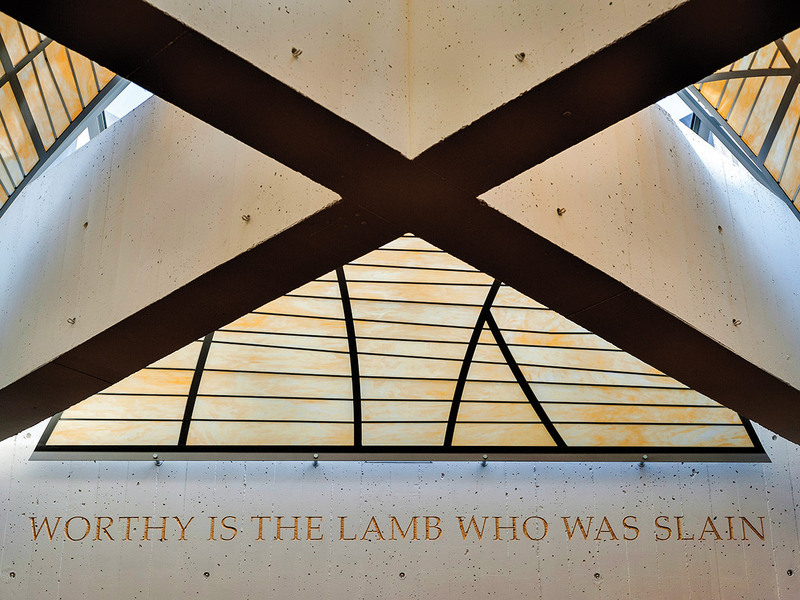 Visitors approach from a long sweeping walkway that opens to the west, descending toward the river valley along a hillside. 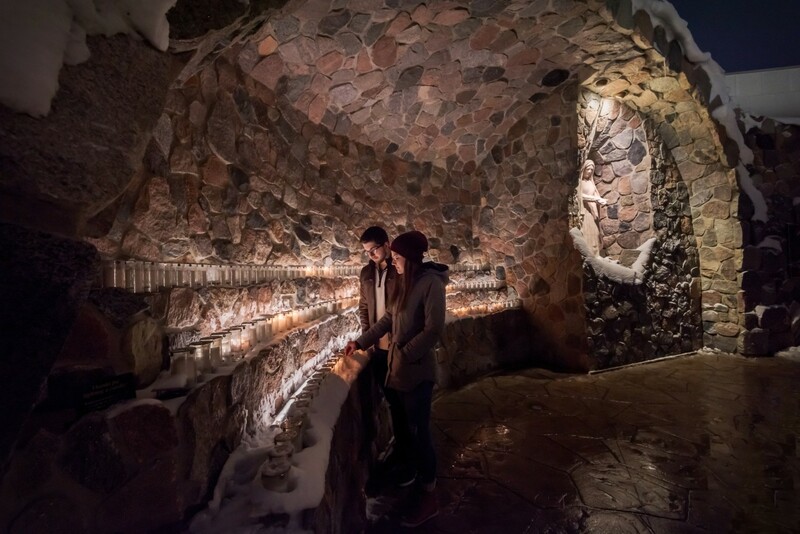 A tunnel provides protected access to the new University Center nearby, and an under-slab heating system allows students to visit the grotto during all seasons of the year. 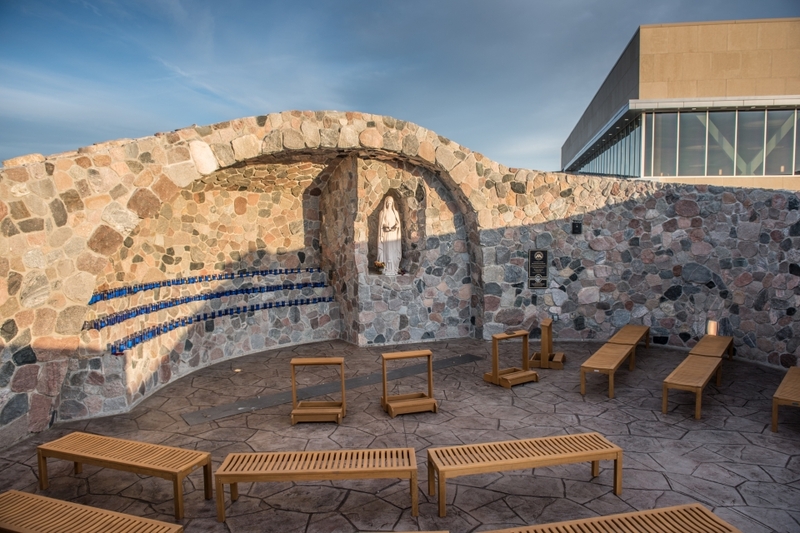 Local fieldstone integrates this project with the material palette employed elsewhere on the campus, and it emphasize the permanence of this place of prayer. 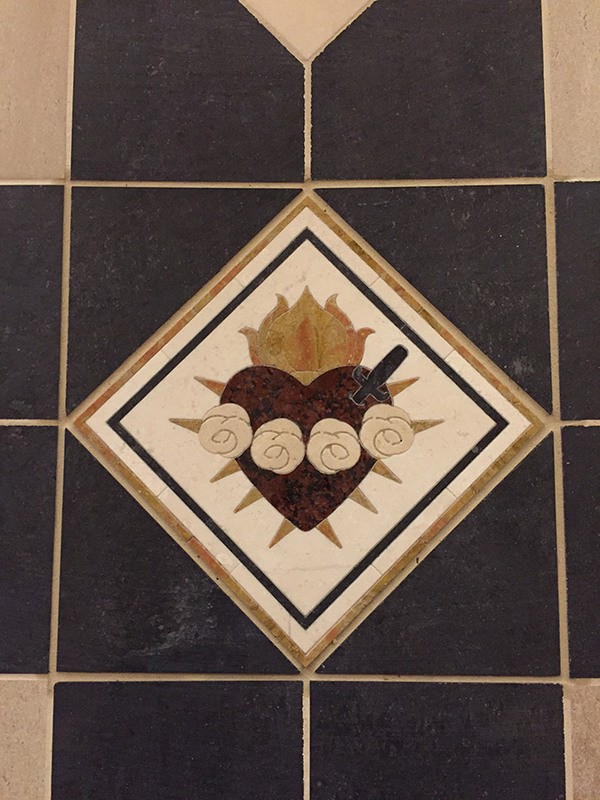 The heart of parish life is the church building. 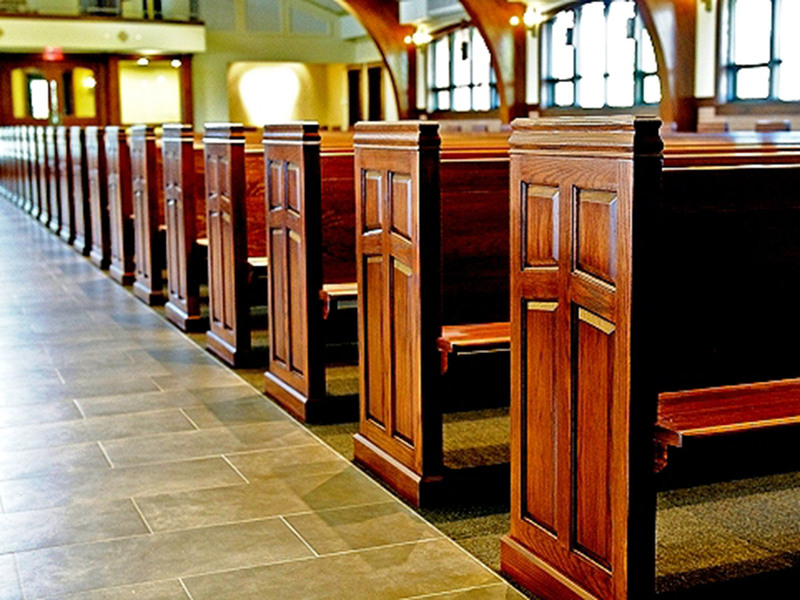 However, much work and ministry depend upon the related buildings and spaces to support the life of the church community. 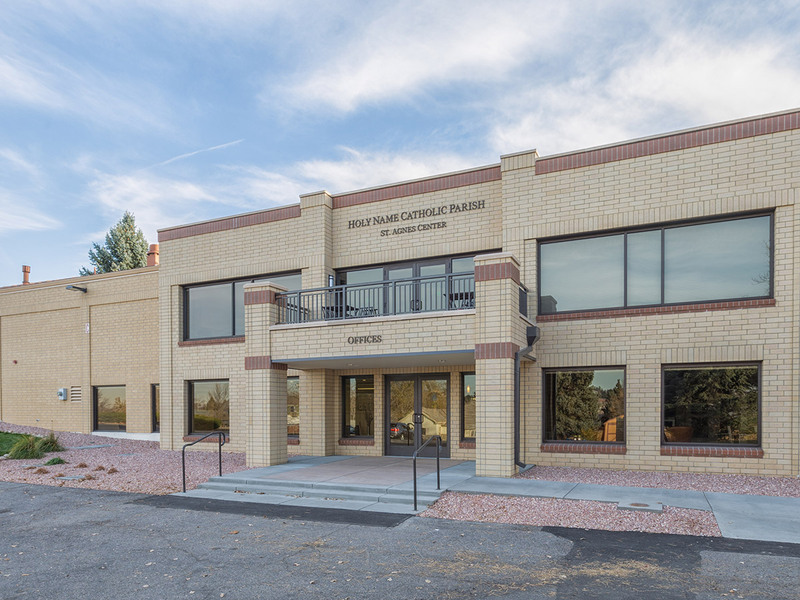 At Holy Name Catholic Church in Sheridan, Colorado, a proper parish office and additional classrooms and meeting spaces had been deferred for many years. 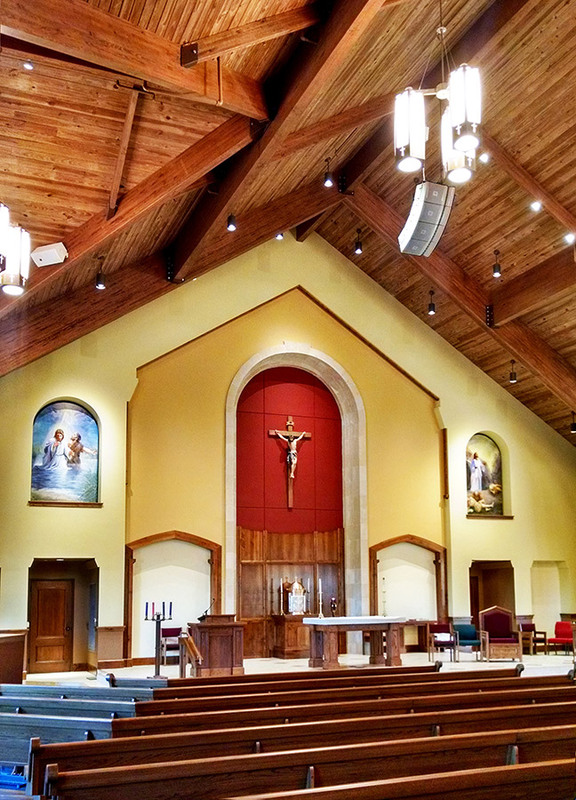 Integration Design Group was asked to design a two-story addition to the existing parish hall building to accommodate these needs. 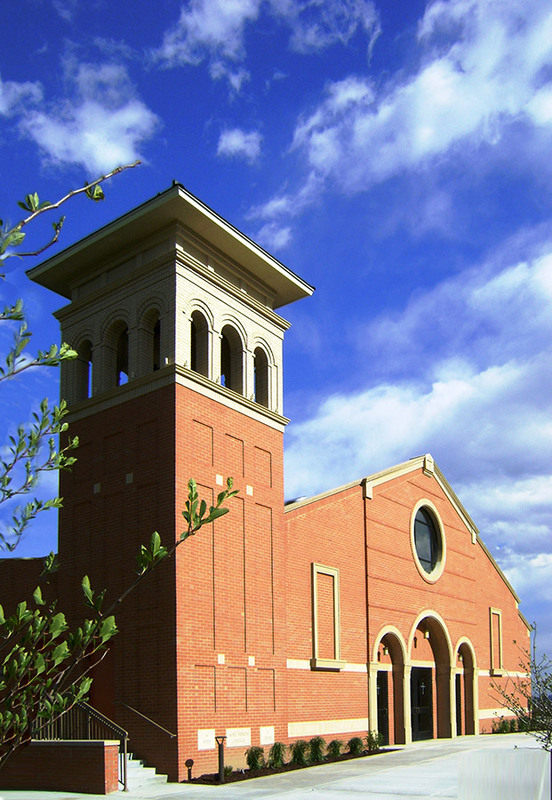 The resulting construction integrates well with the existing building from 1995. 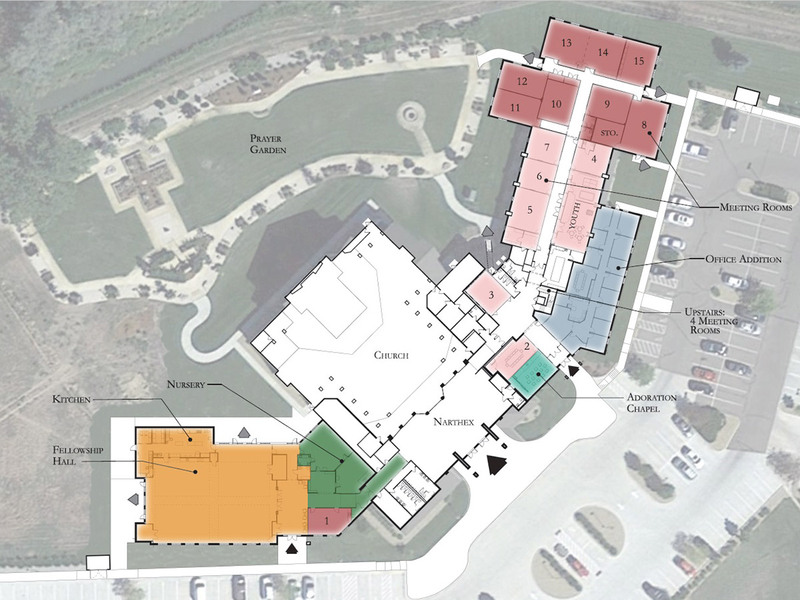 A new patio was created as an amenity for the flexible classroom space on the upper level, and it extends over the parish offices’ entry below. 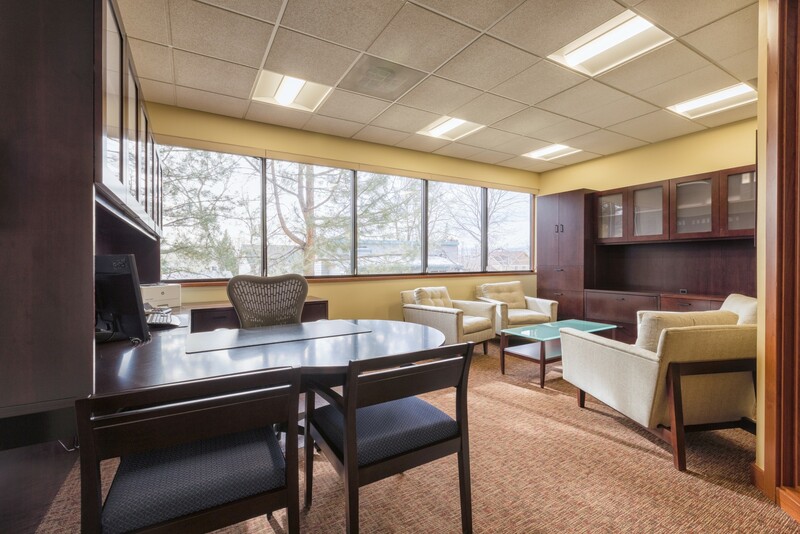 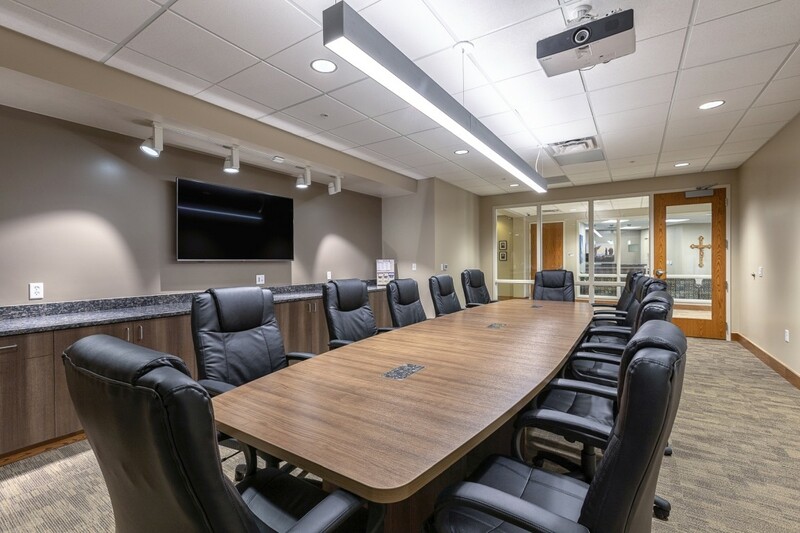 The interior design of the office and conference areas is a very clean, transparent design with rich color, light stained wood trim, and extensive glass between spaces. 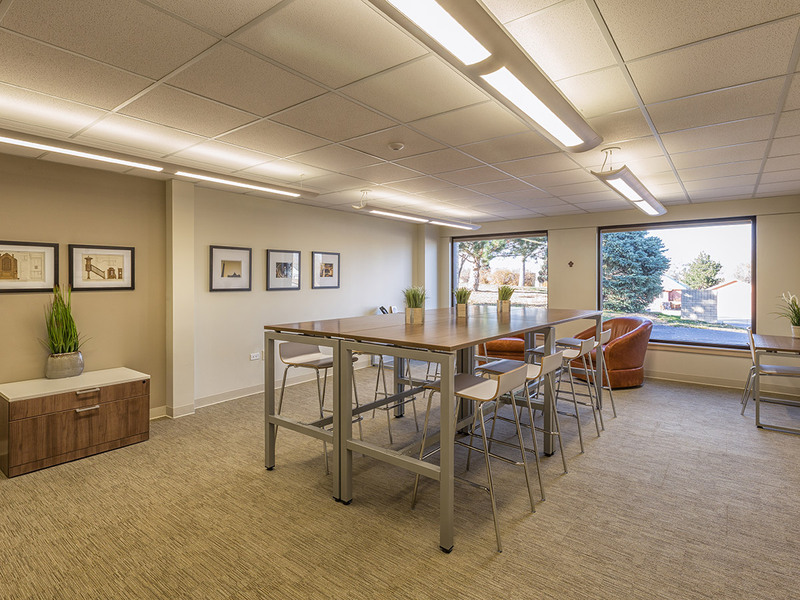 Daylight fills the rooms, even on the lower level of the building. 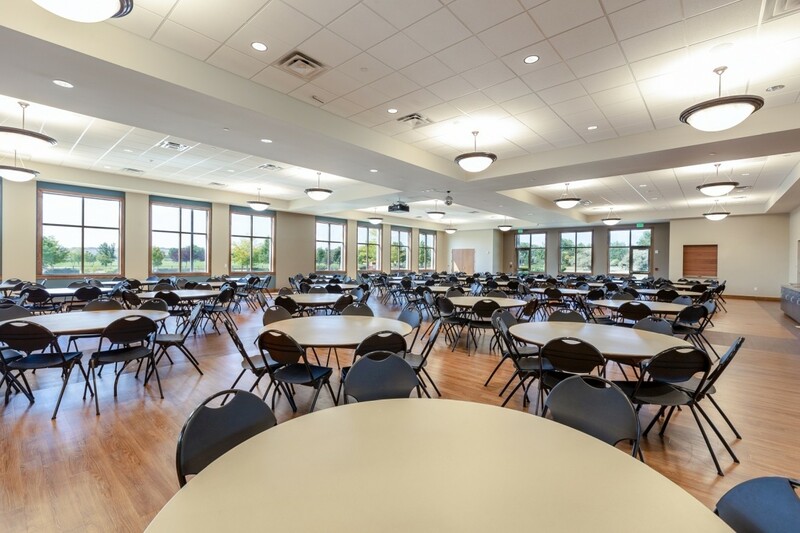 The spaces in the upper level are flexible for gathering three separate groups or one event for 100 or more. 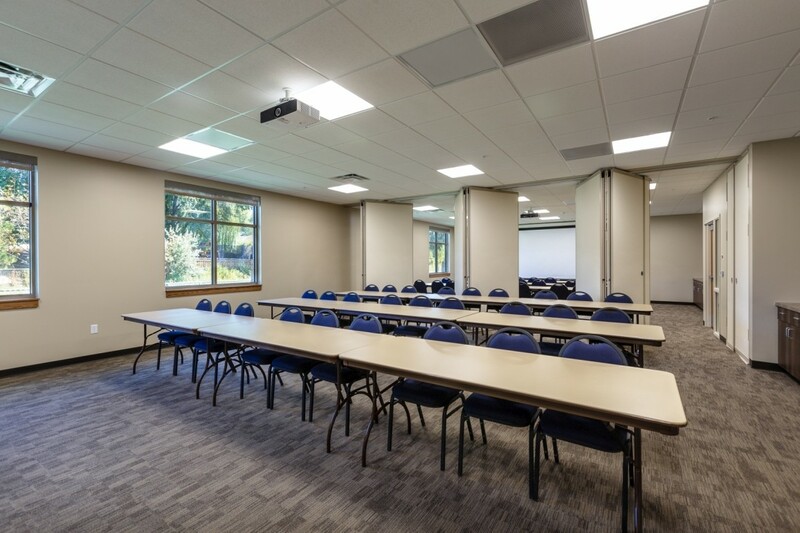 The project was very successful, meeting many important needs with limited additional new building area.